George Thomas and Bobby Bell, a pair of graduates of the Philadelphia School of Golf Architects, migrated their professional shingle to the West Coast around 1920. They quickly established themselves as a go to pair for pulling quality golf courses out of the challenging terrain of this part of the country. Along with Alister MacKenzie they went on to produce some of the finest golf courses in this region. Ojai Valley Inn was created around the same time of it’s more storied sister Thomas-Bell designs like Bel-Air, Riviera, and Los Angeles Country Club. 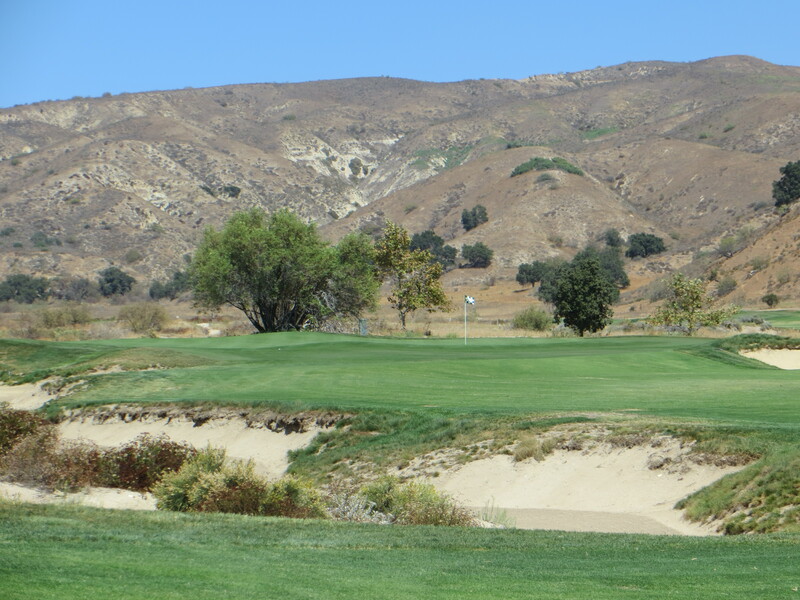 Set against the dramatic mountain ridges that surround the Ojai Valley, you will see genius of these two men in their ability to refine the effect of the rugged topography with innovative routing and implementation of the strategic design concepts that make their courses a joy to play. The tight configuration of the available land for golf led them to an unusual course routing that includes three Par 5’s and five Par 3’s in a Par 70 layout that now measures just under 6300 yards from the back tees. 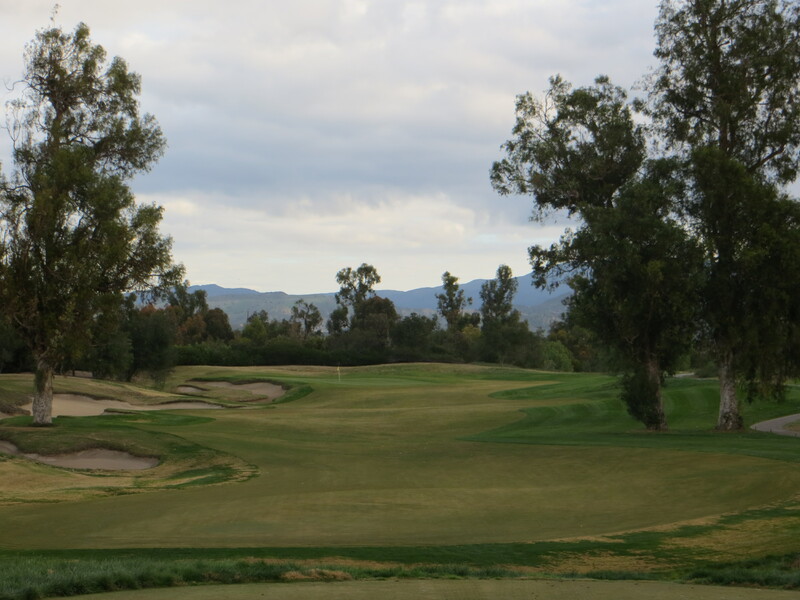 But when you consider about 350 yards in exchange of a long hole for an extra short hole and the effect the hills and the wind have on lengthening many approach shots, there is nothing meek about the golf challenge Ojai Valley presents. This set of green surfaces are as consistently small as any I have seen on a championship course, so finding the target requires great precision. They have segmentation and slope which means approach line and trajectory really matter if you are going to avoid putting humiliation on the greens. The signature high edge, flash faced bunkers that Bell brought to all of their creations coupled with the drastic fall offs adds intimidation to the mix. To have success out here it takes a tactical approach to driving to find proper approach positions based on the day’s pin. There is a convenient grass turf driving range and short game prep area just below the golf shop, make use of it to get your swing tuned in before you embark to the first tee as the front nine opens with five holes that will get your immediate attention. 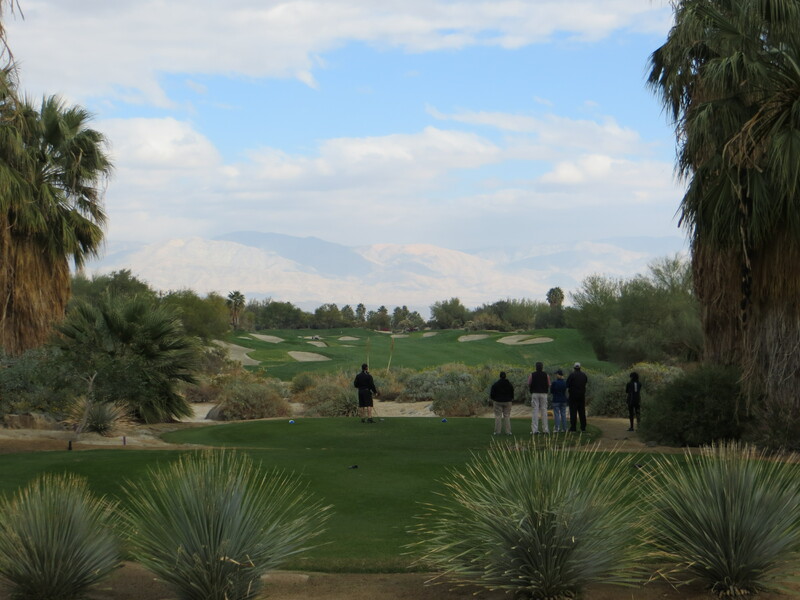 They play across some of the hilliest terrain on the property and demand disciplined shot making right out of the gate to avoid inflicting serious scorecard damage early in the round. The first two holes you have to put your tee shots in a relatively small landing area (see the Hole-By-Hole Analysis below) to have a credible approach to two very angular green complexes. 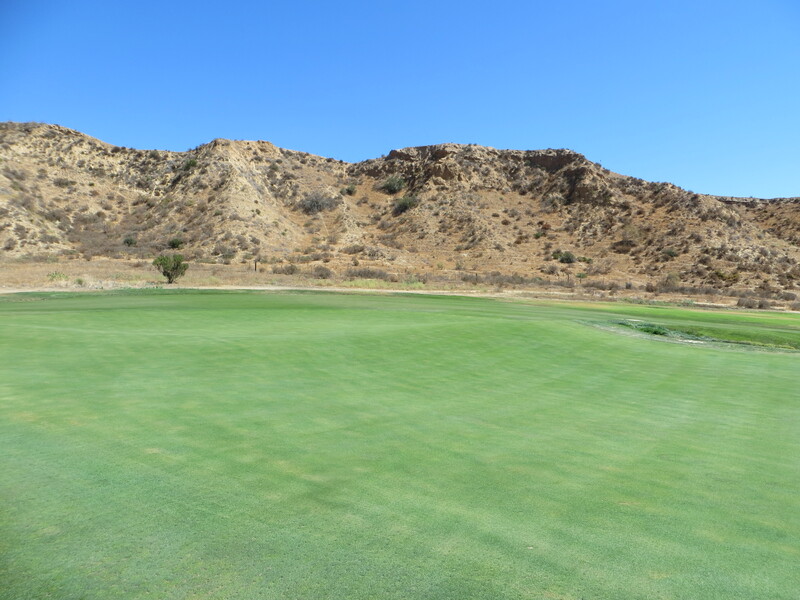 On the second if you succeed in finding the center of the fairway, you have a short club in hand but are staring through a large picture window at a steeply pitched green that hovers above a harrowing barranca from which there is no recovery. Two short Par 3 holes on the front, the first of which you reach at the third, require delicate short shots into tiny greens with no bail outs. The 100-yard pitch on the third seems innocuous to the eye, but picking the right club given the elevation change and any wind can make this very small target particularly elusive. After another bracketed carry across the “Deer Canyon” on the short Par 4 fourth, you face a classic George Thomas uphill approach over a browed Billy Bell flash faced bunker that guards the left front of the green. The pitch up the hill better have serious friction because the green is barely the size of your thumb nail. Take a pause on the precipice tee of the hole they call “Condor’s Nest” to appreciate the glorious backdrop the surrounding mountains present as you look down at this long Par 4 unfurling below your feet. This represents a swift change in gear as four of the next five holes will give you plenty of room to unleash your swing and channel your inner Dustin Johnson. The seventh hole, “Crosby’s Creek named in deference to the Hollywood star who played here often throughout his career, is the #1 Handicap hole on the card and it demands two well executed blows to have any chance to make a par. The key is to protect from the train wreck number if you are out of position off this tee, as a stream runs diagonally through the second half of the hole and will give you serious pause in your club selection to reach a very tight plateau green complex framed by trees and deep Billy Bell bunkers. After the second of the short pitch Par 3’s you have a very handsome march up “Eucalyptus Alley” on the long awaited first Par 5 of the day. The green complex set into a hill just below the hotel is framed by stacked flash faced bunkers and makes for one of the many Kodak moments of your day. Negotiating with a birdie putt on the top shelf of the 9th Green….so so so close! Make sure to get a little snack and some cold refreshment from Libby’s Market as you make your way up the hill on the other side of the hotel to the tenth tee. This next series of holes have delectable visuals as they play on the high side of the property to start the inward half. The look off this tenth tee is majestic as a sweeping long Par 4 falls below your feet and then works back uphill to the tight green complex. The mountain backdrop is the stage for the Pink Sunsets this place is known for. Two scoring opportunities presents themselves on the long Par 3 and short Par 5 that follow as you work your way back to the thirteenth tee to play a mirror image Par 4 adjacent to the tenth. Preparing for the final run you start wrapping back around the lower end of the property you experienced on the opening nine where elbow room is going to disappear and precise shot making will prevail. 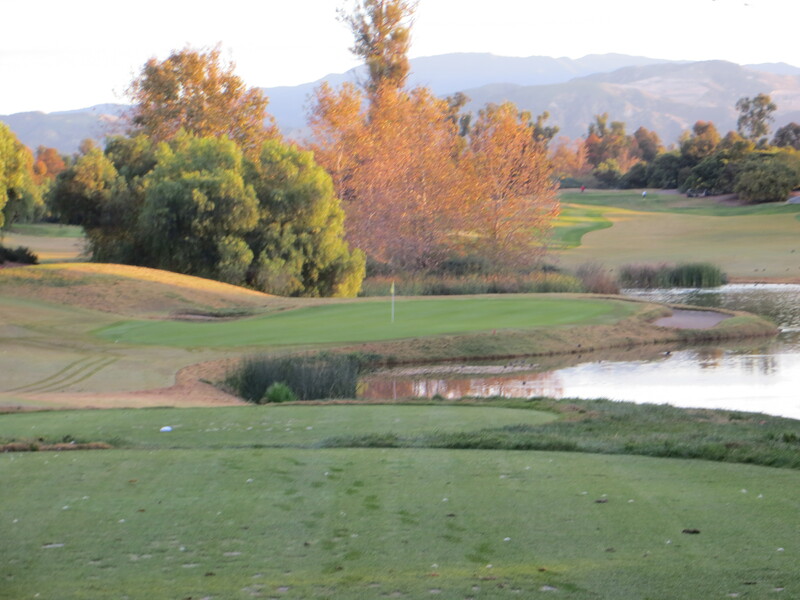 You need to take advantage of the getable Par 3 and Par 5 at fourteen and fifteen because the mysterious “Lost Holes of Ojai” are just ahead. In the years of the Second World War the military had abducted the land under a few holes in a remote corner of the property which made them disappear. But in a restoration in the late 1990’s these two “Lost Holes” were rediscovered and, along with the stiff finishing hole, set up a dramatic final exam to your golfing day. Part I is “Captains Pride” a unique survival par three that you may think does not fit the flavor of the course. But the spectacular view you take in from the precipice tee makes it the signature hole in all their publications. The parameters of this hole are as tight as any you have seen all day so a very conservative approach is requisite in avoiding a bad number at this point of round. Part II is the multiple choice section of the test called “Inspiration”. The tee box on seventeen is perched by itself, cocooned by high mountain topography, which creates a tranquil respite that many have used for memorable wedding ceremonies. Nupitals aside it takes two dexterous decisions and well executed strokes to make a much needed par on the second of the reincarnated holes. The essay section is the eighteenth, a steep march back up to the clubhouse which will put extra pressure on trying to win the back nine Nassau. The amount of defensiveness required in the final approach is totally dependent on your tee ball position. There are pars to be made with a dexterous pitch and putt from short right if the carry over the yawning Billy Bunker that fronts the left side of this precipice green complex seems too much to swallow. If you picked the right tee length there is a good chance the tally ends up in the satisfactory range, but I assure you that on reflection you are going to feel you left a few out there. A return visit to get another shot at this intriguingThomas/Bell creation is something I look forward to as well. George Thomas, an east coast native who cut his design teeth with others from the Philadelphia School of Design back in the teens, moved to the west coast in 1919 to establish a beachhead of quality designs in California in the full Golden Age tradition. 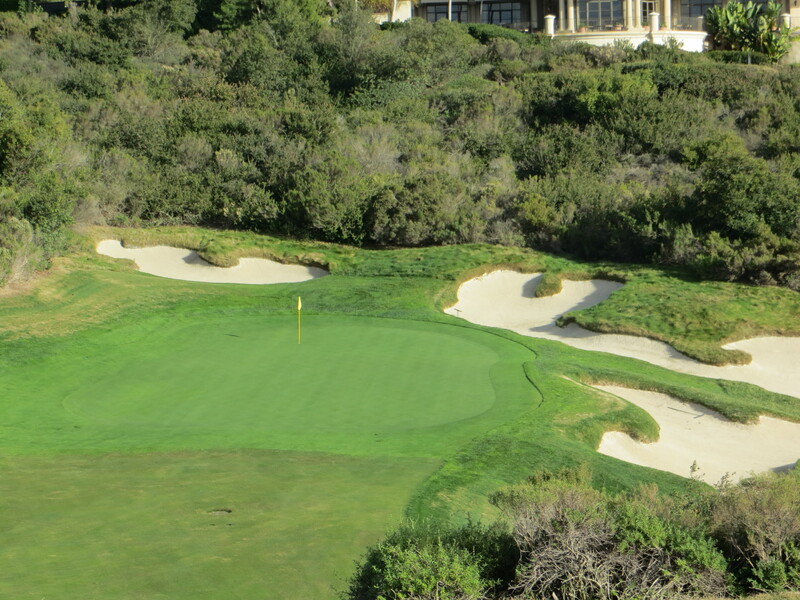 With Bel-Air and Riviera already under his belt he took on the job of redesigning the two courses at Los Angeles Country Club at the request of their members. 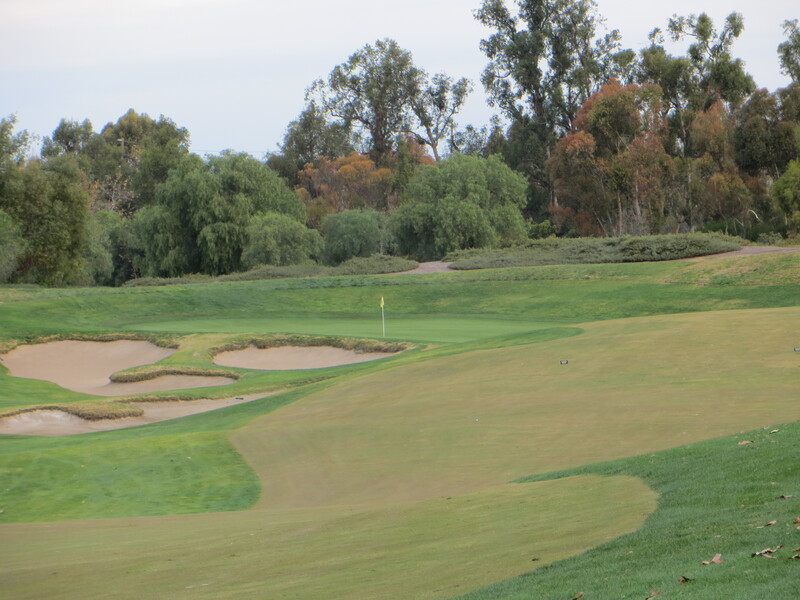 What he and his sidekick William Bell created with the North Course at LACC turned out to be the centerpiece of the George Thomas design portfolio in California. Over the next 80 plus years a combination of meddlesome board decisions and some nature-based changes mollified the character of the course to the point where it had lost it’s soul. In the early 00’s an initiative by some younger members sought out Hanse Design to propose a plan to restore the North Course to the original design. Gil Hanse, with the capable help of his longtime associate Jim Wagner and some historical perspective from Geoff Shackelford, put together an ambitious restoration plan to bring the course back to it’s original character and full grandeur. The board had the good sense to fully embrace the restoration plan and in 2009 a staged restoration began to take place. The work included rediscovering and restoring the original Billy Bell bunkering, returning to their rightful homes greens that had been senselessly relocated, thinning out the 80 years of overgrowth of trees and related ground vegetation that had compromised the views on the course, and establishing throughout the course the influence of the dry wash that had given this course it’s distinct character. 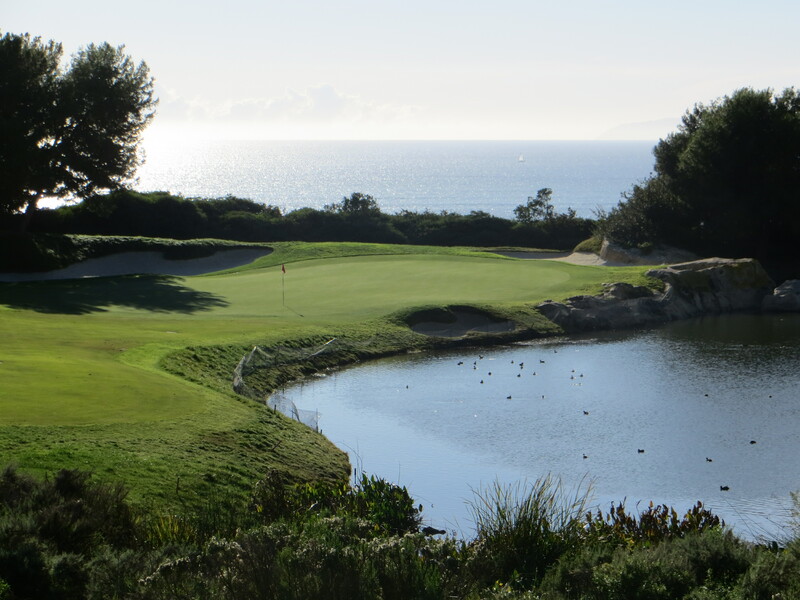 There is so much talk these days about recapturing the look and playability of courses of the Golden Age of Golf Course Design and that is precisely what Hanse and Associaties have done at LACC. The fact that the USGA and R & A are bringing a Walker Cup to LACC in 2017 and the U.S. Open in 2023 would tell you that the restoration was a roaring success. Built on hundreds of rolling acres of some of the most valuable urban real estate in America LACC sits in the middle of Beverly Hills in the shadow of apartment buildings, palatial homes, and commercial development. They have maintained a reasonable buffer for the most part-while on the property you feel relatively secluded from all that with a few notable exceptions. The ground itself is a wonderful hilly piece of property that presented interesting possibilities for Thomas and Bell for the routing of holes and placement of tees, hazards, and greens. The genius of the design is that they used the flow of the land, the dry wash, and nature’s assets to create holes that do not intrude on the environment, they look like they were always there. Stepping onto the first tee you take in the flavor of the course immediately. The grass platform for the teeing grounds are not distinct from the fairway in front of you. The vast continuum of short grass just melds into the course that is unfolding below your feet. The placement of the fairway and green side bunkers is very creative. They give clear direction to your strategic options off the tees and on approach. Many times you will realize that the movement of the pin 30 feet on the green can change both the preferred distance and angle of the approach you are trying to set up. This is why an investment in a good caddie is a must when you play LACC. As you get out through the second and third holes the presence of the dry wash makes itself very apparent. Fortunately there is no water running through it and the fact that they do not seem to let it get overgrown means you can technically play from it without grounding your club. Having said that it is incumbent upon you to give the presence of the wash full consideration when weighing options of approach lines and club selection. Both of these holes will taunt you in terms of carry to reach the putting surface, especially if you are not in the fairway. First lesson to be learned at LACC is a bogie is an acceptable result when double or worse is possible taking on a shot that is just beyond your skill set. The par three fourth is one of the signature holes on the course-from it’s teeing ground the full splendor of LACC is apparent. Elevation change, wash, sand, even some exposed sand hills thrown in for good measure makes for a true Kodak moment. Once again Thomas gave you options that allow you to mitigate risk and protect your scorecard. Getting it close is a real risk/reward deal but hitting it to the fat part of the green should mean making par is very doable. If you forget what neighborhood you are in take a gander back up the hill from this green-that is Lionel Richie’s little bungalow looking down at you. In 1927 Thomas wrote a book called “Golf Architecture In America’ at about the same time he was doing this course where he talks about the notion of designing a course within a course. The idea was that holes could play to different strategy, even different par depending on how they set the tees and pins on a given day. As you will read in the link to the Hole-By-Hole Analysis below five through nine are all half par holes that speak to this notion-depending on set up and your degree of chutzpah they can be very different day-to-day. 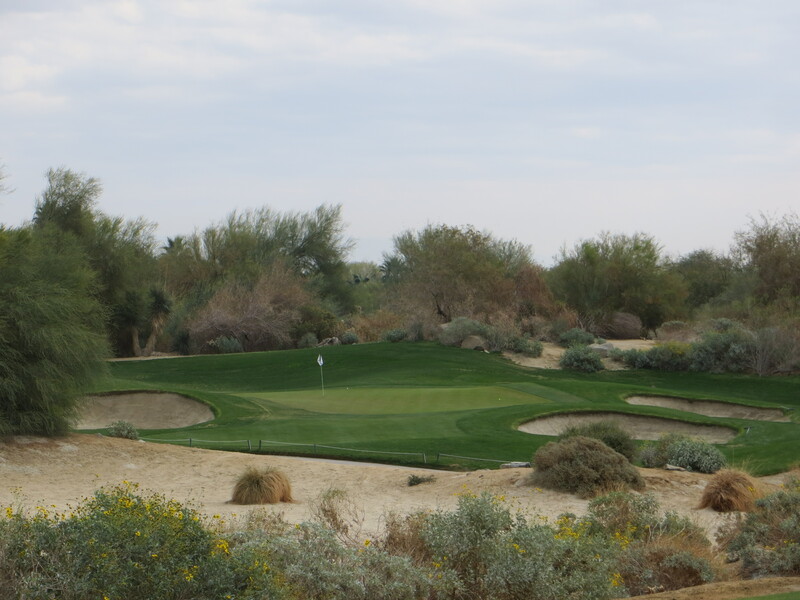 Six is a “drivable” par four where you have to be certifiable to try to go for the green. Seven is a par three where laying up may be the best option depending on the wind influence. Eight is a truncated, switch back, shish-link of a five par that throws all strategic convention out the window and dares you to play with a sense of abandon. If you survive the tee shot on tourniquet approach to the par three ninth a double has turned into a three with one swing of the club. The only thing I will guarantee is that once you have played through this fungible part of the course you will have goose bumps or the sweats depending on how you fared. The inward nine is even more dramatic and just as thrilling. 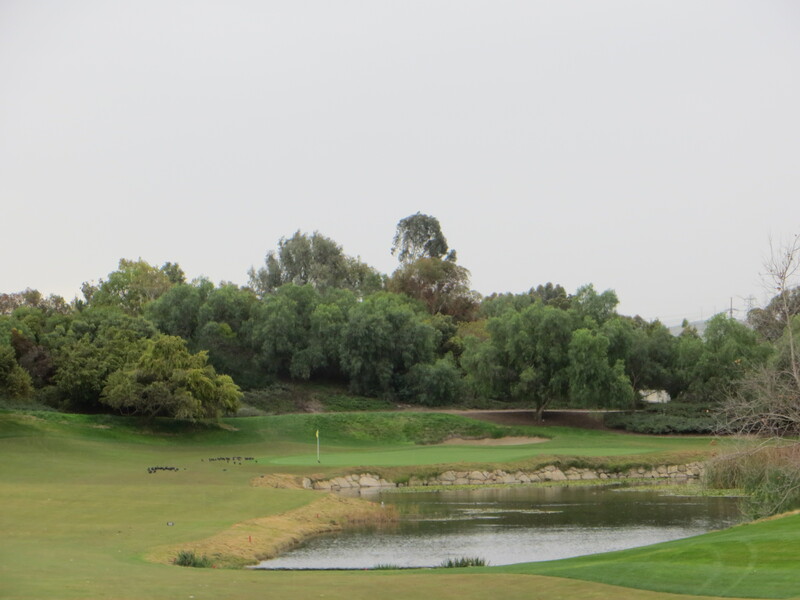 The tenth shares fairway with the sixteenth, a characteristic you see repeated a number of times through the round. This gives the course the appearance of great width and allows you to see through to others holes as you play. It reinforces the seamless character mentioned with continuous tee boxes to the fairways and reinforced often by continuous short grass between greens and the next teeing round. Thomas is playing with your mind because in spite of the width presented there is always a favored area, usually 20 to 25 yards wide that you want to place your tee ball in to have a sporting chance of taking on the challenge of the hole. The other postcard par three is the downhill eleventh. Here they reversed the classic Redan with an abruptly downhill tee shot that must be played off a side hill short left of the green to feed the ball onto a green that runs away to the right. Like most Redan holes, trying to take on the pin directly will likely put you in the nasty short side bunker or over the green with a thankless recovery shot at hand. 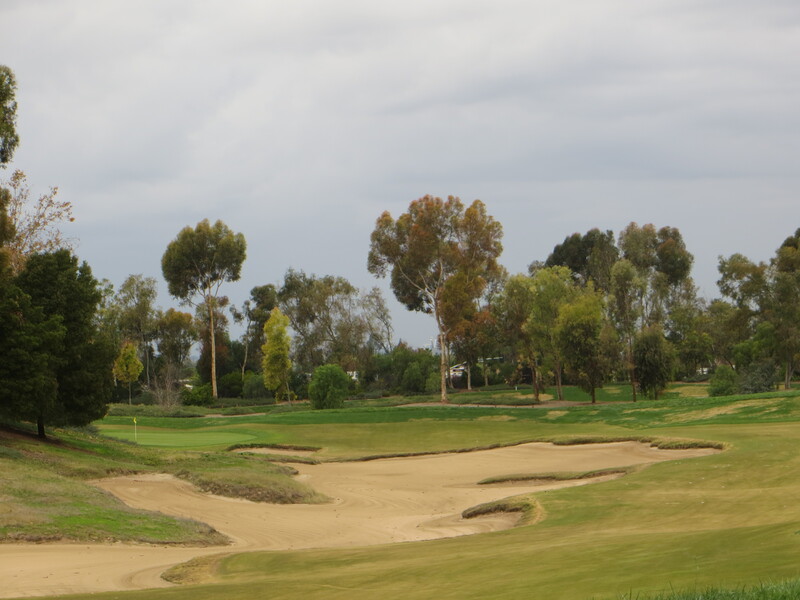 You cannot talk about LACC without paying homage to the Billy Bell Bunkers. They are deep, intimidating, thoughtfully placed, yet totally playable. The toothy edges and gnarly brow grass is what people notice but the steep faces tend to avoid plug lies and the playing condition of where you end up-both sand and slope-lends itself to a typical bunker shot swing as long as you are wisely willing to accept 25 feet for the first putt. On many of the par fours Bell embedded a bunker in the center front of the approach creating a notched arrangement in the front of the green. This provides a pinable section on either side of the bunker but often one of those sides hangs perilously above nastiness you do not want to engage. More decisions….this course is all about making clear headed decisions. Jim Wagner, with the help of Geoff Shackelford, labored tirelessly to restore the sod walls on the bunkers to support the signature jagged look that Bell had originally built into these hazards. The three par fives are all holes you can try to reach in two if you are very long and very disciplined. The fourteenth is one of my favorites because even as a three-shot hole the lay-up and approach are fraught with difficulty if you bite off more than you can chew. It looks so simple yet the slightest deviation in execution can mean severe consequences to your scorecard. I have read elsewhere that the genius of George Thomas was his ability to create something special on a short hole with little topographical feature. He did this repeatedly at Riviera and the short approach and putt fifteenth is another gem. The slender, crescent shaped green orients to tightly fitting bunkers with just enough elevation to mask what should be a simple, short iron approach. The hole can be as short at 75 and as long as 135 but I guarantee you more people are shaking their heads side-to-side rather than up-and-down when they are walking to the sixteenth tee. Every great entertainment experience has a memorable finish and on that score LACC will not disappoint. With the Nassau bet in the balance the last three holes will determine the winner based on judgment, execution, and a little bit of existential fate. The walk to the house encompasses three par fours where success comes from thoughtful drive position followed by flawless execution on approach leaving an uphill putt where you can threaten the hole. If you find the fairway off the tee on the sixteenth the approach is a repeat of the tee shot into the reverse Redan arrangement you saw on the eleventh just off your left shoulder. 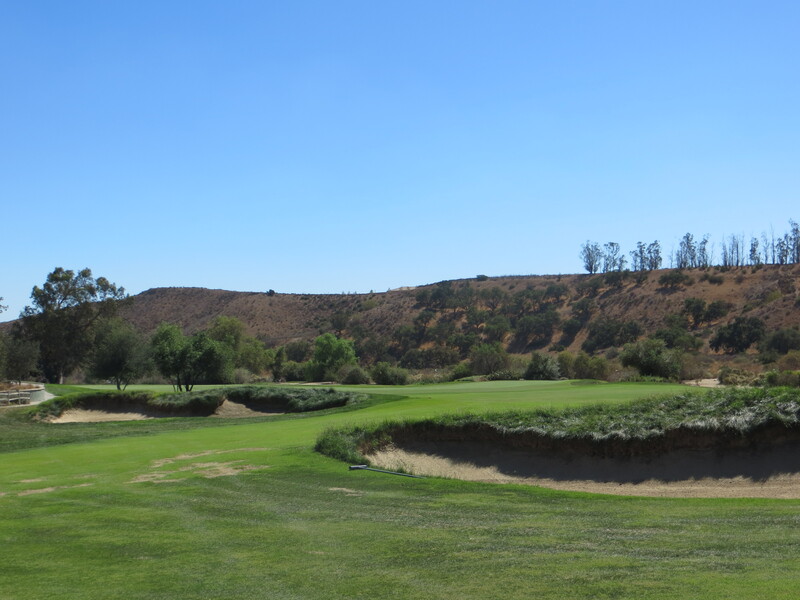 From the tee on the seventeenth the full monte of LACC sits below your feet-the wash, layered bunkering, and a wide driving area with a very focal sweet spot. The second is one of the most articulate approach shots you will hit all day as the green is set on a diagonal to your aiming line behind a nasty bunker front left and no bail out salvation anywhere. The finish is a walk back up the subtle ramp you played down on the first with a driving area that makes the 18th at the Old Course look narrow. Once again the position of your tee ball is critical to getting an accessible angle at a green tightly ensconced by furry sand. The ambiance of this place is traditional with a kitchy twist. The unusual pennant style of the LACC logo is everywhere on the course- on hole stanchions, tee markers, pins, practice green flags, scorecards, hats, and the shirt you will want to take home with you. This theme lends a youthful collegial feel to the facility that just seems to fit. Most important George Thomas created a course that is a graceful combination of raw nature and good, balanced design, a golf experience that will cling to your memory long after the walk is over. 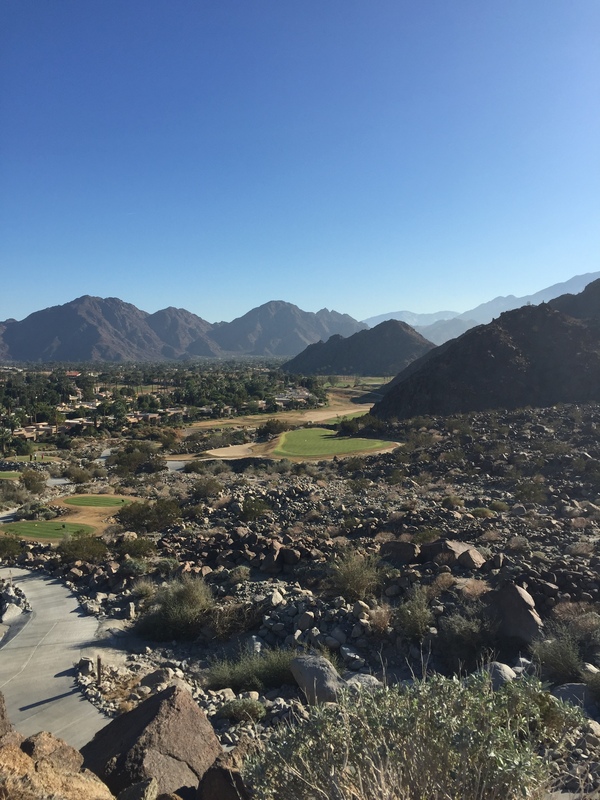 Built in the mid 1980’s as part of the PGA West lavish vacation home development, the Arnold Palmer Private course nestles at the foot of the scenic Santa Rosa Mountains. 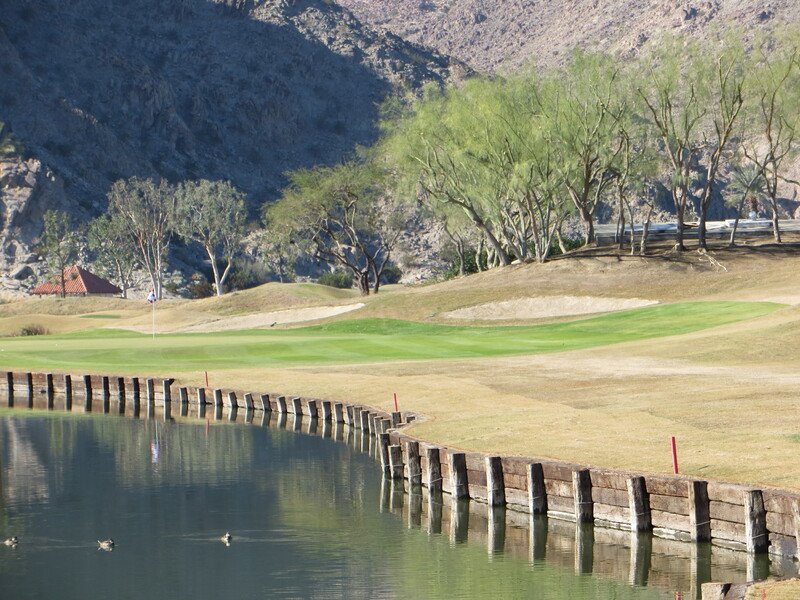 This is an array of wonderful visual holes that weave among manmade water hazards and manufactured rolling desert topography to present a onerous challenge emulating the TPC design tradition propagated by PGA Commissioner Dean Beman at that time. 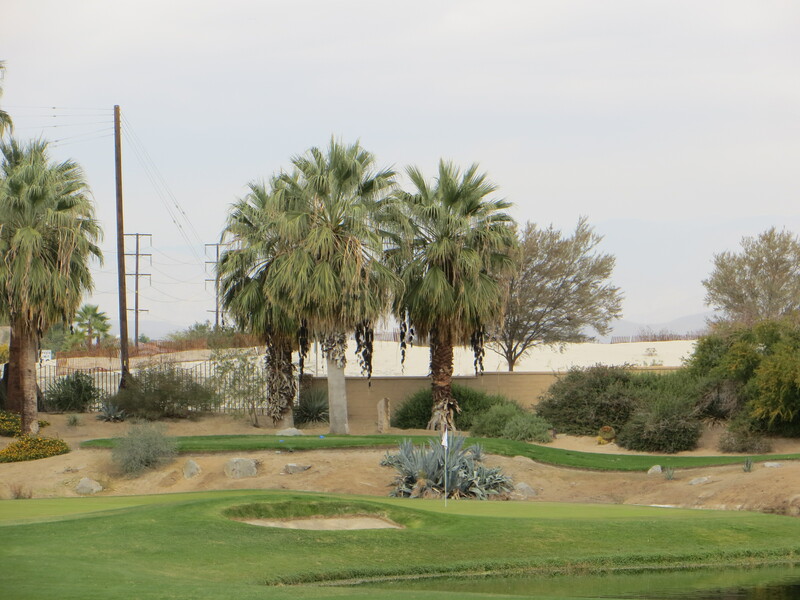 The course has been a regular feature of the tour’s Bob Hope Desert Classic (and it’s later commercial iterations). You may remember it as the place where you saw David Duval shoot his remarkable 59 in the final round to win the 1999 event. 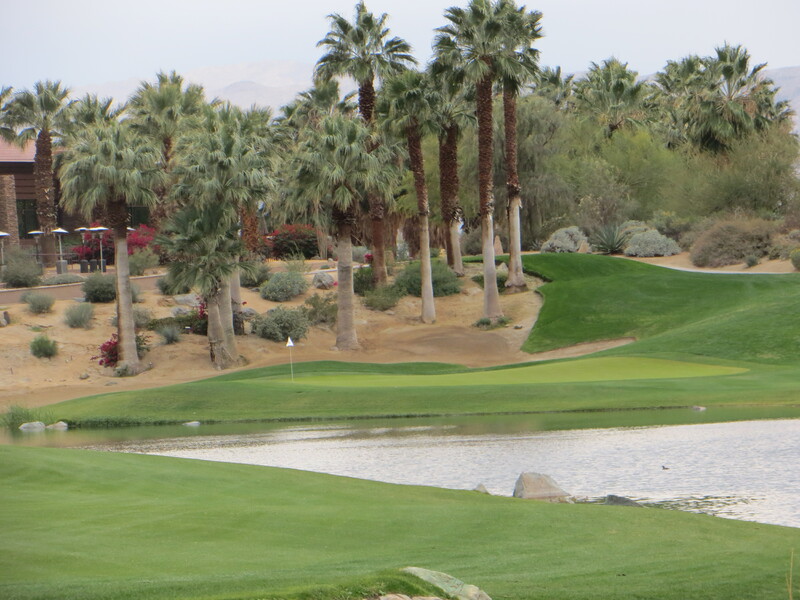 Arnold was obviously keeping up with the Dye’s who created the neighboring the PGA West Stadium Course at the same time in following the TPC formula of cookie cutter driving areas, flanked by ominous water and deep bunkers, and tight green complexes with large undulating surfaces. It is not a track for the meek of heart or those who lack trajectory and spin in their game. For the pros the slope is an impossible 143 and mere mortals face a stiff 133 from the 6500 tees. This course was designed to be taken on full bore. The only way to play it is Arnold’s way, roll up your shirtsleeves and be aggressive. The biggest challenge is in the four pars and not necessarily the longest ones. The par fives are relatively mundane and similar in design except the finishing hole which has some chutzpah (Duval hit driver, 5-iron to 8 feet and drained it for eagle to cap off his 59). The par threes have lots of visual interest but not that much bite. The front nine works clockwise away from the clubhouse to the north and back. 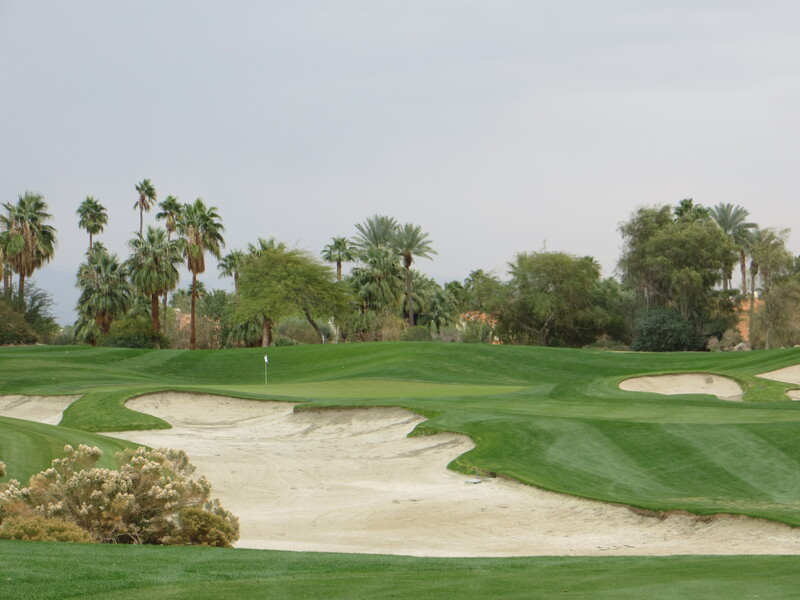 The back nine mimics the pattern in a counterclockwise direction which means that given the day’s desert wind direction you should have the same difficulty factor on half the holes on each side. The real treachery is in the multitude of forced carry cape par fours strewn throughout the layout. Holes like 4, 7, 9, 10, 13, and 16 all use the same combination of harrowing water adjacent the full length of the hole with a tight green complex cordoned by water as well. When you get deep into the back nine you reach the Venetian section of the course from the 14th on where the canals haunt every shot and the only thing missing are the voices of gondoliers humming a sad tune if your shots get wayward right. 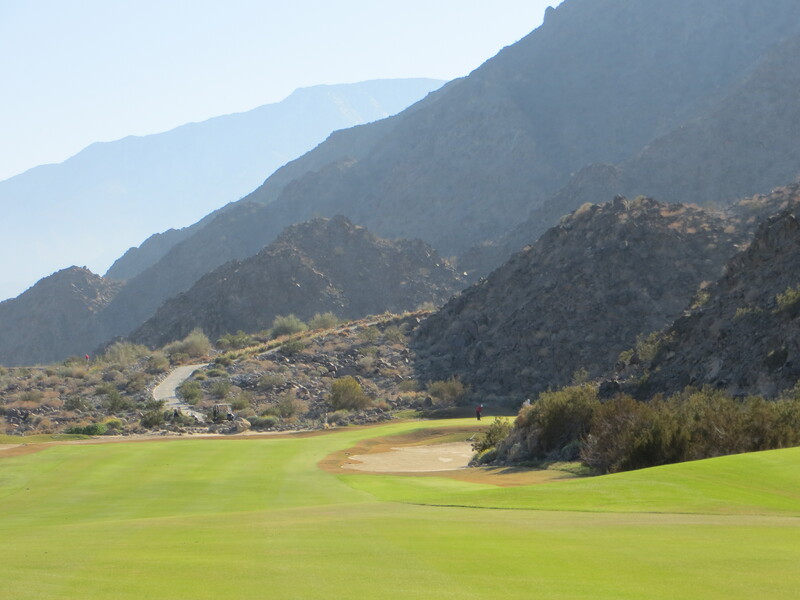 These final holes are spectacular to look at, set up against the foot of the mountains with towering sheer rock faces looking over your right shoulder on every swing. At least the short holes are short and it ends with a Par 5 so maybe you can find some redemption for your scorecard at the end. This is a high end facility so the conditioning of the course-fairways and greens-is impeccable. They keep them on the pacey end of the Stimpmeter so you will have to mind your approach position to try to leave yourself uphill putts you can handle. Cavernous bunkers throughout are real hazards as are some of the grass mogul fields that abut many of the green complexes. As I have seen on other TPC style courses most of your recovery game is with a sand iron or a loft club. The rest of the facility is first class as well. They have a wonderful informal dining area that overlooks the staging area and sprawling natural grass practice grounds which you should take advantage of for a post game lunch and lick your wounds session. 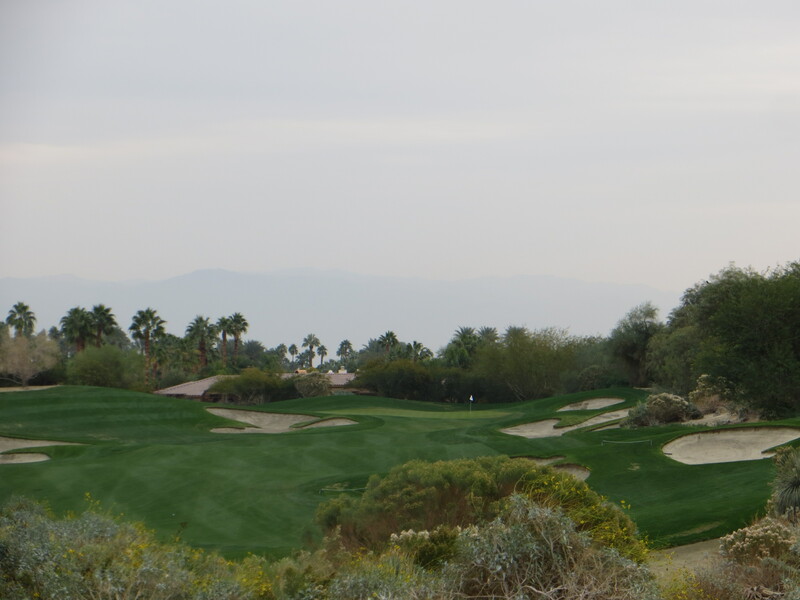 Mountain View is the demure younger sister of the feature Firecliff Course at Desert Willow. Designed by the same crew of Michael Hurdzan and Dana Fry with Tour Pro John Cook commiserating, it shares the look and feel of Firecliff with a more user friendly interface. 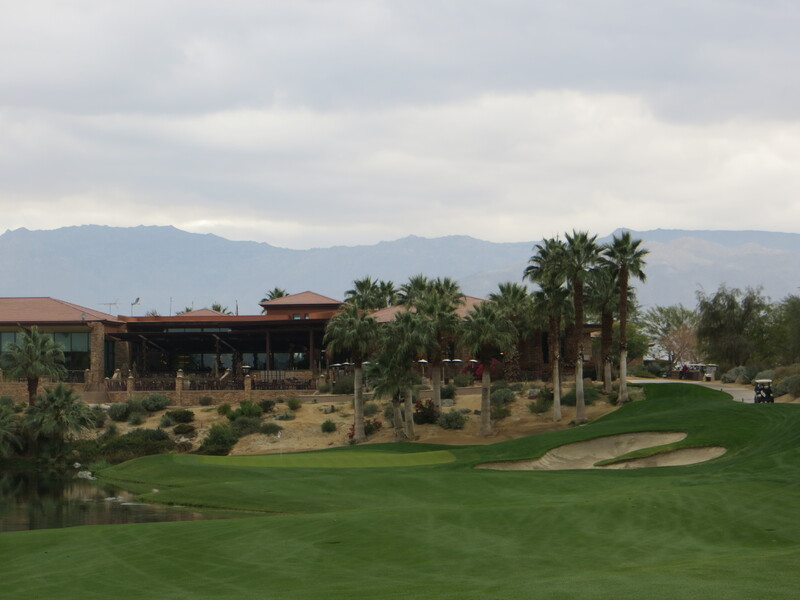 It shares the stunning backdrop of the San Jacinto Mountains throughout the course and plenty of money was spent moving dirt to create interesting topography with desert flora plantings as accent. 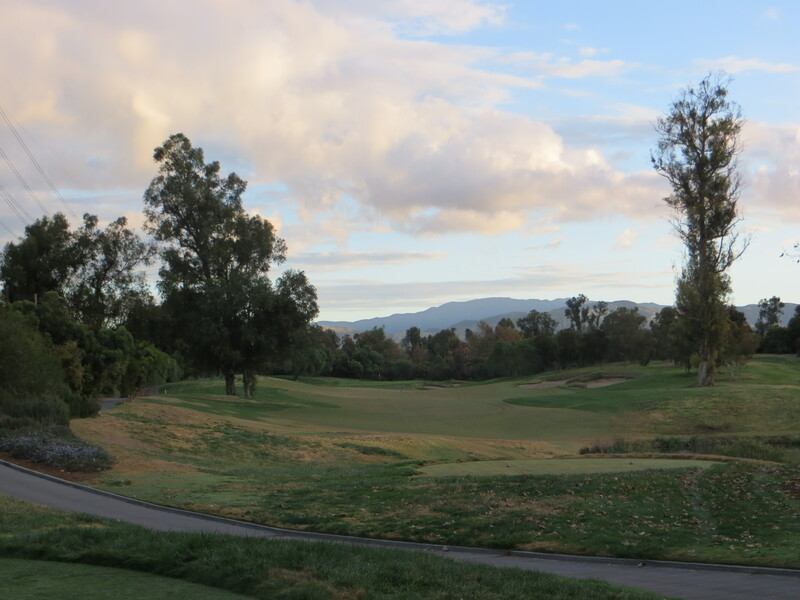 Mountain View was built to be the member’s everyday course, a kinder, gentler experience with less obvious danger and reverberations to the scorecard. The metric difference of 5 less in the slope from the 6500 yard Blue Tees speaks to this. There is simply more unfettered access to the preferred driving areas and the green complexes on approach and the severity of penalty for missing either is less significant. The small greens have somewhat milder undulations and are kept at a pace much less disarming than her more athletic sister. Having said that this is not a course where you can play on auto pilot, it takes your full concentration to plot your way around. If I have any criticism at all it is that most of the holes are relatively straight, very few holes that turn dramatically to focus your attention to the A drive position off the tee. But even without elbows on the corners the green complexes still dictate a preferred drive position in the generous driving areas. The small size of the greens and the fact that many are raised from the fairway is the scorecard’s best defense. The front pins are particularly difficult because there is no advantage way to be short of these pins and have an uphill birdie opportunity. Your pitching recovery game will get a workout because you will miss greens so an adept short game is a must to scoring well. Much like Firecliff reading these greens is difficult with all the static of the mountain backdrop and the manufactured topography. If you have your Everything-Breaks-To-Indio compass on hand it can prove relevant on many of the reads. 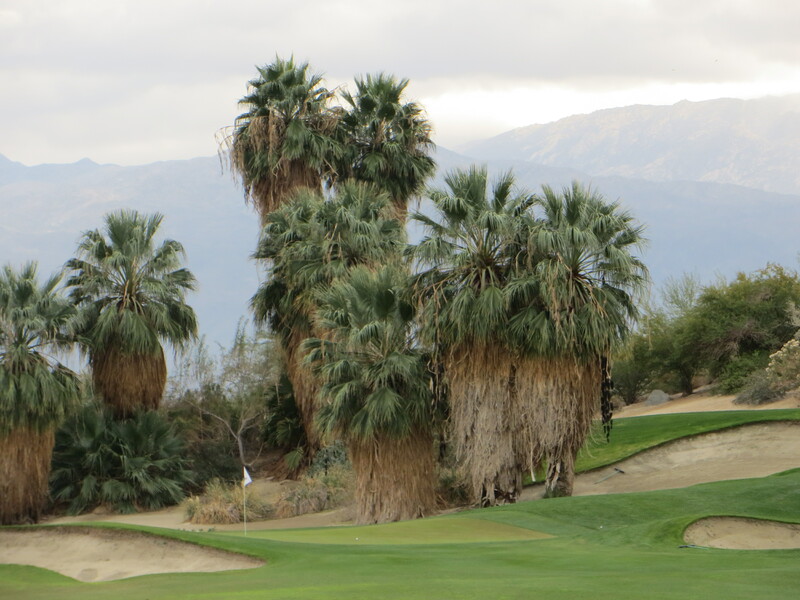 This is a fun afternoon of golf, an opportunity working taking if you are in Palm Desert for long enough to play both courses at Desert Willow. I actually like it as a warm up round the day before taking on the full Firecliff challenge. 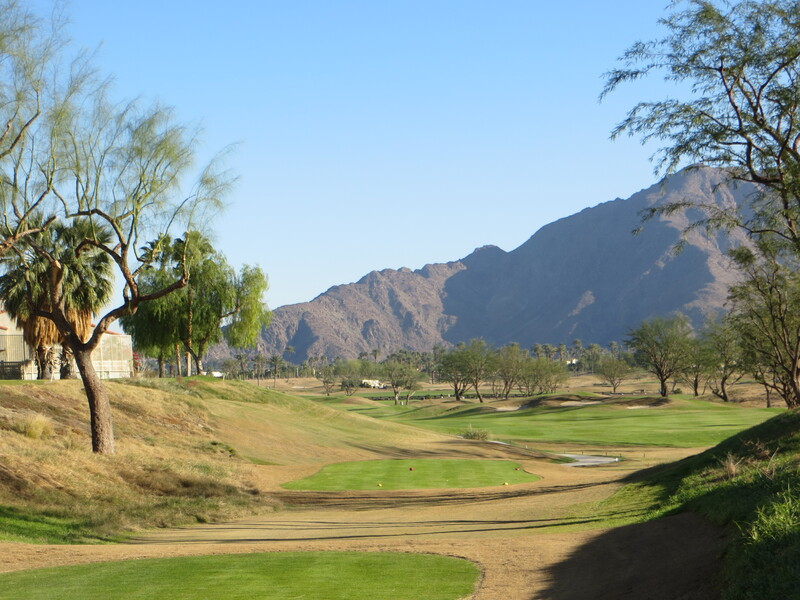 The Mountain Course at La Quinta is a challenging and visual creation from Pete Dye’s TPC Sawgrass period. It bears similarities to the stadium course in Ponte Vedra in that there is plenty of visual intimidation, especially in the green complexes, yet Pete gives you a fair line of play on every hole as long as you have the discipline to follow it. This is a positional driving course, you must plan carefully from each tee to pick specific lines that will give you advantage angles into the green arrangements and the pin of the day. 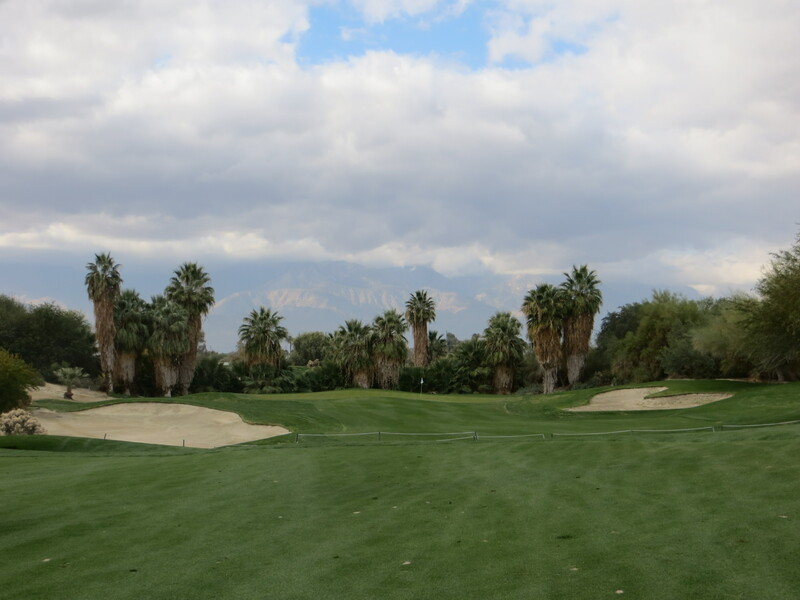 The course is carved into the base of the Santa Rosa Mountains in Palm Desert and looks like the Hollywood set for MASH. You fully expect to see Hawkeye and Trapper John standing next to you on the practice ground. There are many Kodak moments of the holes set against the breathtaking mountains so you have to make sure you don’t let your mind wander to often from the task at hand. As you see at Sawgrass the bunkers are ever present, over 100 bunkers and waste areas, with a large splash of water as well, confine the driving areas throughout that make finding your proper drive position a challenge. The truth is the sand is very playable and it is more about intimidating the player while they are choosing their flight lines than punishing them terribly for missing them. The water is the punitive element to mind and is actually in play every time it presents itself. Like most Pete Dye courses, the green complexes are what separates this course from the ordinary. Every green seems to pop up from the fairway with carve outs of grassy hollows and bunkers that make elevated approaches with spin the shot of the day. When you miss a green it takes real pitching imagination and agility to deal with the abrupt elevation change to the surface as well as the swoops and swerves you ball engages once it gets on the green. At 6300 yards from the White Tees there is plenty of challenge for the average bear. Only two par fours are over 400 yards from these tees, but the elevation changes into the greens make many shots a club or so more on the approach. Even with a mid-iron or hybrid in hand the tight green targets give you plenty of opportunity to show off your recovery game. Pete wants to know if you have the nerve to take on a left flag on the Par 3 2nd? The front side has a very cool sequence. It begins with a neat finesse hole that sets the tone for day-controlled driver and precise approach play into s kitchy green complex. Your heart rate quickens on the second hole, a testing par 3 with a harrowing water feature that can wreck your scorecard early in the round. Plenty of scoring opportunity from 4 through 7 with a couple of imaginative par fives in this stretch. The finishing holes on the outward nine are very gamey, especially the 9th which wears the #1 Handicap Hole moniker with great pride. The inward nine starts with a series of holes right out of TPC Sawgrass-three turning Par 4s with waste area containment on one side and some nastiness on the other. These are the only holes that make you feel like this course is in a gated community…..a very high end gated community at that. There are some jaw dropping second homes that look more like villas than vacation condos. After an innocuous three par 13th you turn the corner to the 14th tee and voila you are in Tolkein Hobbit Land for the next four holes. This is by far and away the coolest part of the course with the imaginative holes routing in a tranquil valley between the majestic mountains. You just expect a large booming Yul Brynner voice to emanate from between the peaks warning you that you are entering a region of peril. These four Dye holes bear out such a warning but they are eminently playable if you keep your wits about you and do not try anything outside of your skill set. 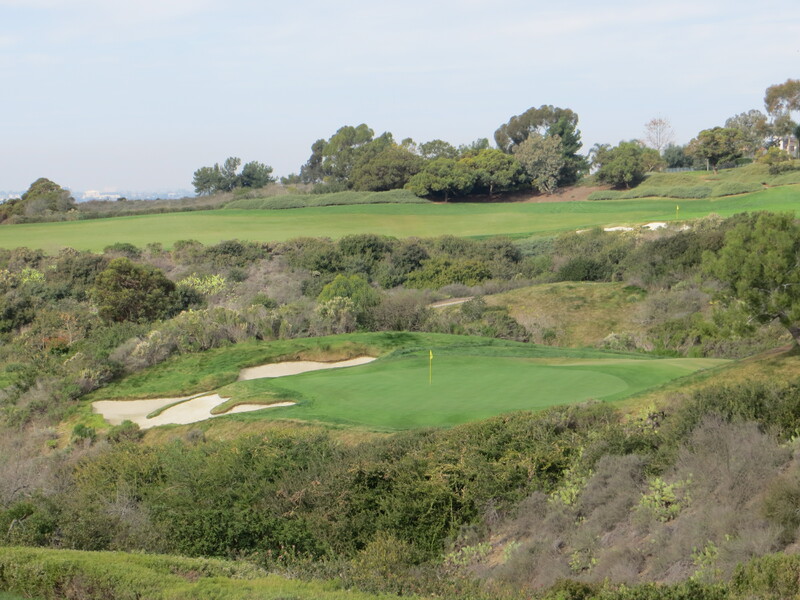 It is worth taking a moment when you get to the Par 3 sixteenth and hike up to the perch which holds the back tee. You could swear you can see all the way to the Joshua Tree Forest from there, it is a grand view of the vast expanse of the desert and the Santa Rosa Mountain Range beyond. A more detailed account of this creation is provided in the Hole-By-Hole description below. When you are done tallying the score take time to schmooze around the clubhouse on the hill. The interior architecture is on a grand scale with high exposed wooden rafters giving it a homey feeling of a lodge- it makes you want to set a spell. While enjoying some good food and libation in the grill room the tall glass windows afford you a stunning view of the practice area and the course. 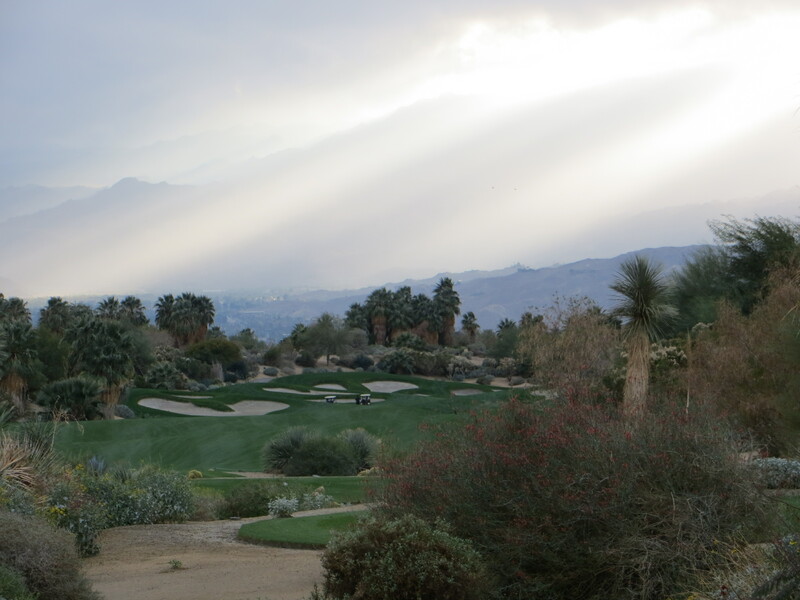 This place is a must stop on any visit to Palm Desert. Pete did a marvelous job putting together a tactical course that will tease and please you every time you play it. Visiting the Newport Beach/Orange County area and looking for another course to add to your dance card? 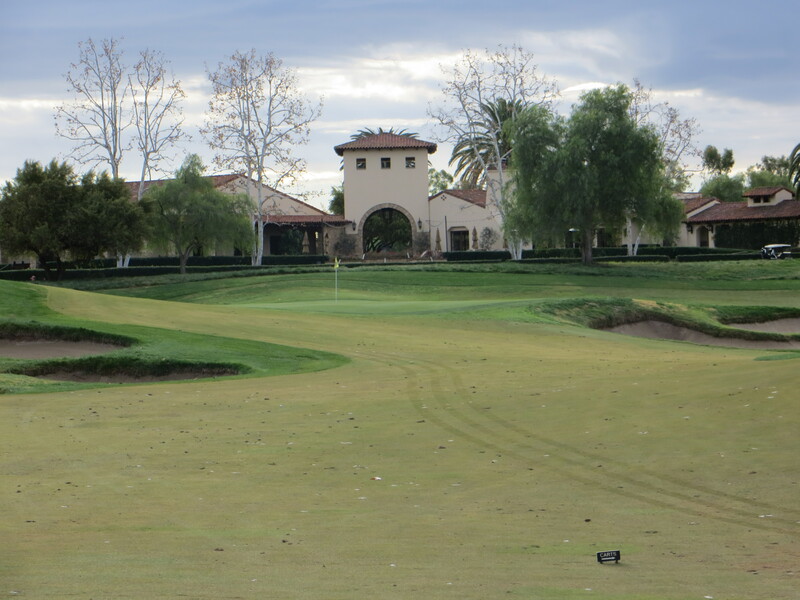 This Tom Fazio design at Oak Creek Golf Club in Irvine is a place to seek out. 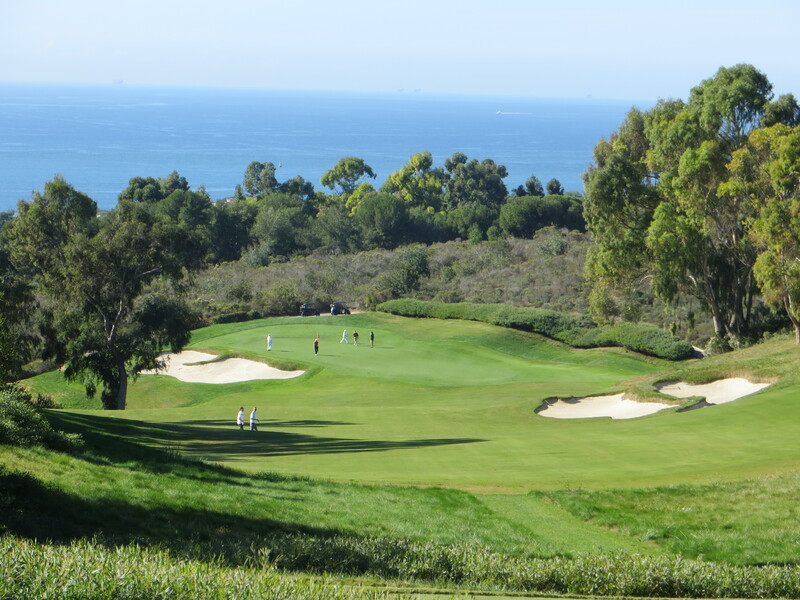 Without the ocean views and the rugged coastal terrain to work with Fazio did a brilliant job orchestrating a golf course through subtle rolling terrain, framing trees groves and flora, and an array of creeks and lakes to create a course that will challenge both your mind golfing skills. Tactically this is a positional golf course with clever offsetting angles of approaches to greens. Plotting your strategy from the green backward gives yourself the best chance of success into difficult green constellations. Buy the yardage books so you have some idea of the layout of the holes and hazards-better yet hook up with a seeing-eye-member who can be your Sherpa guide for the day. The bulldozers had their way here so as was the case with so many courses created in the 90’s the fairways are sculpted giving a lyric flow to the ground that affords very few level lies. The green side bunkering is described as bull-nosed on the web site and you can take this literally because playing a recovery out of the nostril of a massive male cow is no picnic. Having said that, these green complexes are not overdone. There is, as the great golf architect Max Behr would say, a line of charm into each one of them if you thoughtfully position yourself for the approach. The front side begins modestly enough with a couple of manageable par fours but climbing to the tee overlooking the Par 3 third your heart will get to racing taking in the view of the green jutting out precariously into Brady’s Pond. Think Alcatraz with grass. This begins a sequence of holes which make it evident that positional golf is the order of the day. From the tee of Par 4 fourth, called The Grove, you see a driving area framed by a pair of towering goal post trees that have little tolerance for wayward tee shots. 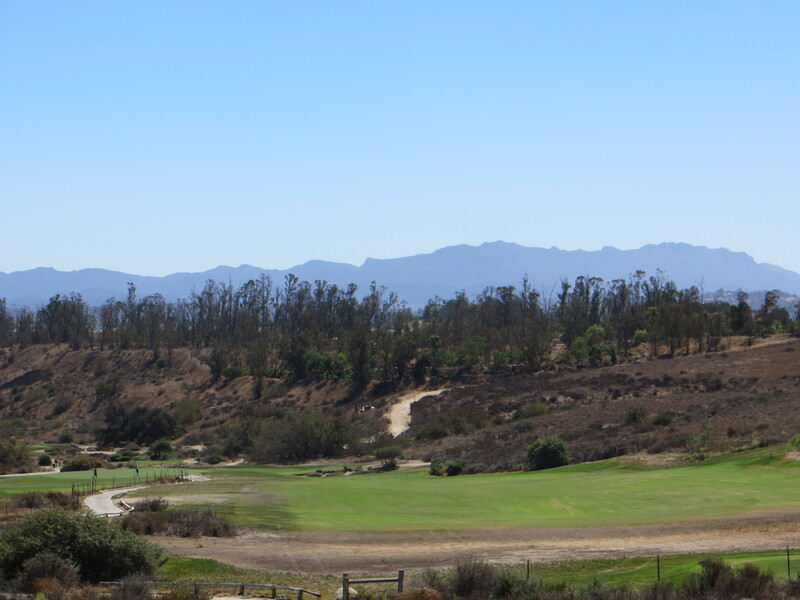 The trees behind the green is where the hole get’s it’s name but the low mountains in the distance give it some southern California romance and remind you that the ocean not so far away. A quick switchback and the challenge ramps steadily up from here to the turn with a stout par four that which calls for length off the tee and careful precision into the green nestled on the other side of Brady’s Pond. Lowell’s Creek is the prominent feature on the long par 5 sixth as it wends it’s way up the right side from the beginning of the fairway all the way to the green surface. Even with a short club in your hand this is a dicey approach as green leans right feeding balls to the edge overlooking. 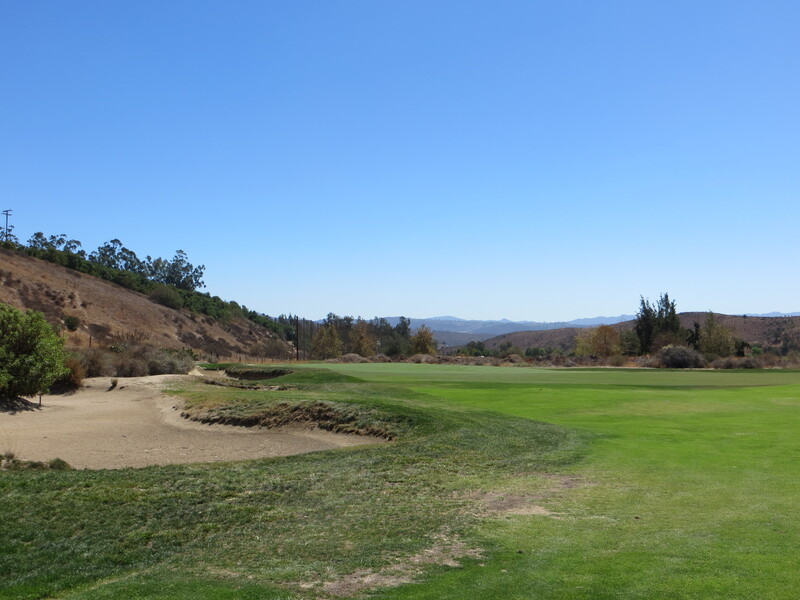 The front side ends with a monster of a par four calling for a long drive to reach the top of the hill revealing a compelling look at a green nestled just below the tile roofed Adobe clubhouse . The back nine will capture your focus early and not let it go until the last drop falls on the finishing hole. The Par 5 Breakout is a mind bending three shot hole for most of us. The key here is staying out of the sand on all three shots. A strong drive on the left sets up a lay up well to the right for a short downhill pitch into one of the tightest green settings you see all day. The eleventh is a subtle and picturesque par 3 where the green sits below the tee carved out of the foot of the hill behind. The shot shape is left to right and you must use the green contour to get it close. Two long par fours with plenty of issues bring you to Chicanery a short par four that will drive the big hitters bonkers. The tee shot is into a narrow neck of the fairway just below a hidden fairway bunker on the right. From there Fazio stuck the green into a narrow closet below the fairway that will require a lawn dart approach to get close. The canopy of eucalyptus trees create a feeling that you are hitting into the Hollywood Bowl during sound check. Just a fabulous golf hole. It only gets harder from here with a long par four called Outback, the number 1 handicap hole. This is a full par 4.75 and a bogey will feel like a par. The middle sized par four that follows is like a cape hole without the water. Named Crescent Moon it adequately describes the profile of the hole and the two slinging right-to-left shots it will take to get on to the green. One more long and strong Par 3 sets up the dramatic finish into Fortitude a dicey short Par 5 that will remind you of the finish at Bay Hill. The drive is a power slinger from the right to try to catch the power slot and chase one down within reachable distance of another peninsula green. More likely you are laying up in the neck of fairway cordoned off by the water that defines the right side of the hole the last 175 yards in. If you land the approach on this green in regulation and you can finally exhale. Oak Creek does not have much national notoriety but Fazio did an excellent job composing a visual golf experience that will be an enjoyable afternoon for players of all skill levels. 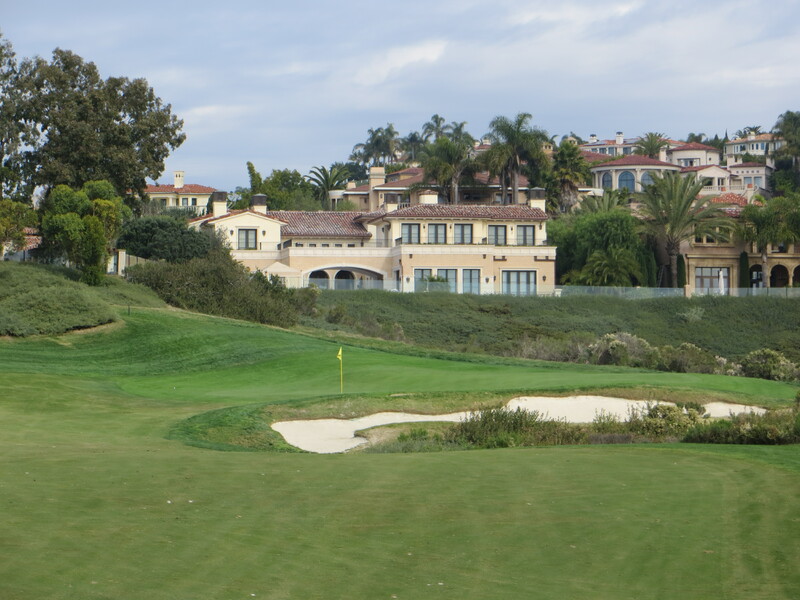 There is nothing at Pelican Hill that is understated and the Ocean North Course is no exception. It was originally done by Tom Fazio in 1993 without much fanfare but when it got renovated in 2005 it took on an awesome character all it’s own. Not as visually scenic at the Ocean South because it lacks the close-to-the-Pacific drop dead looks, but to the discriminating eye the rocky gorges the course traverses give it a Plantation Course at Kapalua feel that is undeniable. As with the Ocean South the hardest thing is blocking out the visual drama so you can focus on the shot at hand. 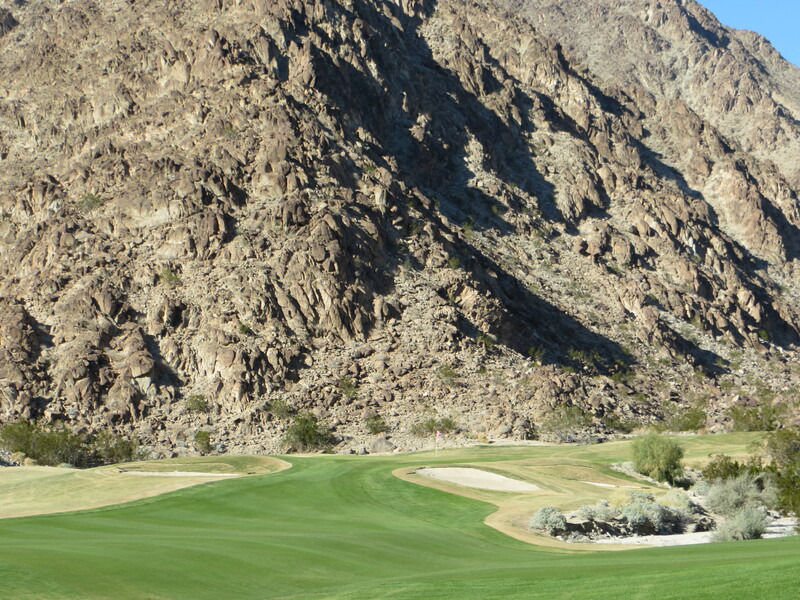 The dramatic elevation changes and the definition to the holes created by the adjacent gorges on both of these courses reiterates the strategic element and makes angle of approach and shot shape germane to efficient play. One of the greatest shot shapers in the game today, Bubba Watson, recently played one of the courses at Pelican Hill from the tips with just a 20-degree hybrid and shot 81. You ever try putting with a 20-degree hybrid? I am sure Bubba had a barrel of laughs doing this especially on a course where shaping a shot can make a huge difference to getting it close. Fazio designs are a master of strategic play for me. His greens are generally accessible, from a specific angle, which means there has to be forethought standing on the tees or hitting the lay ups on the five pars. 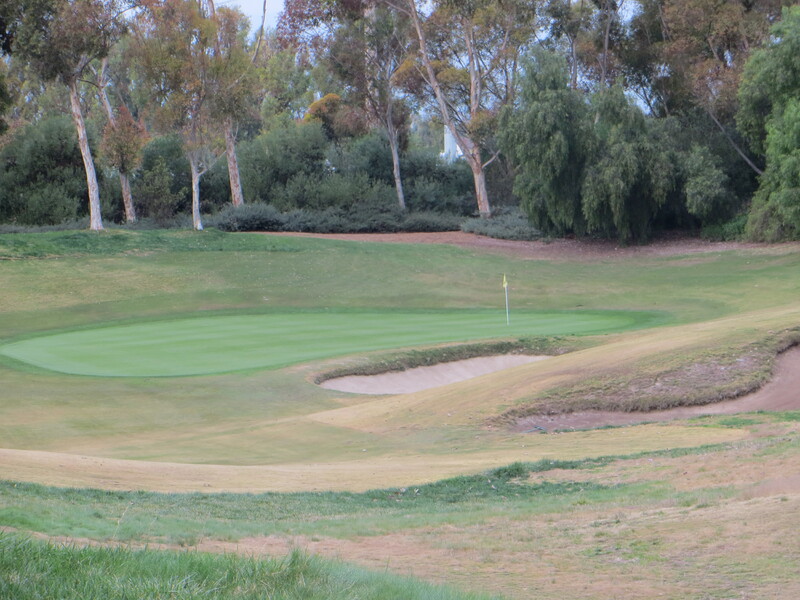 The green complexes are angled to the approach positions often with bunkers only on one side. But many of the greens have rounded shoulders that influence the finishing path of balls away from their intended target. To complicate matters further the Poa Annua greens are like a house of mirrors to read and will leave you scratching your head when obvious breaks go the other way. An early piece of the shock and awe comes on Number 2, the first par 3. This is a knee knocker standing of the tee peering over the gorge at the green slightly below on the other side. Doubt creeps into mind as you decide if the elevation change or the wind direction is more significant in your club selection. For sure it favors a right to left curve to work up the angle and pitch of this 40-yard long putting surface. 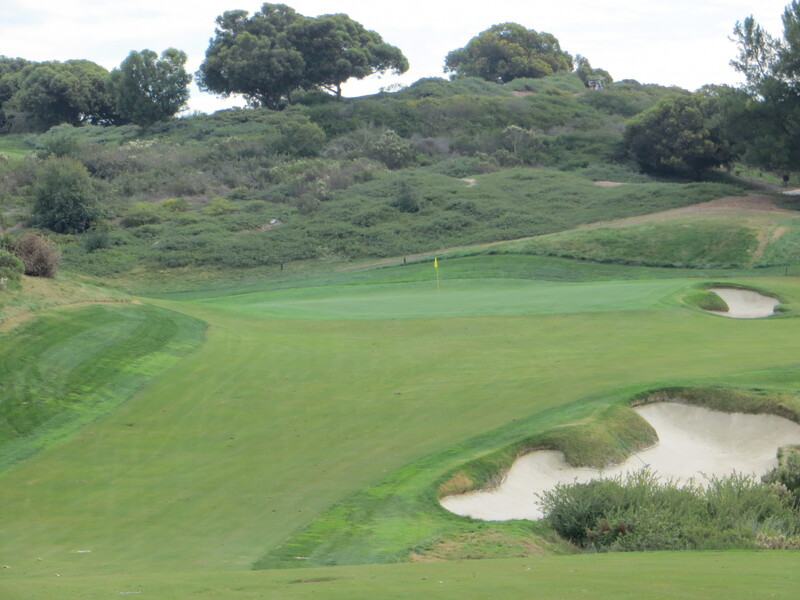 The Par 4 fourth is typical of the Fazio design swagger. The hole doglegs left of the tee favoring a draw but the green below the approach area is set back right which means a soft high fade works the best into a green with a high bank on the right. You need the full bag of tricks here, sometimes on the same hole. Unique architectural composition makes the Par 4 seventh the number one handicap hole of the day. Standing on the tee you see a fairway split by a 40-yard long bunker goading you to pick your poison. The left fairway is the shortest and most accessible route home but this puts the full threat of the bunker in play off the tee. From the safer right fairway you have to manipulate a high fade into the front left corner of the putting complex and let it feed onto a very small green. Corporate CEO money is well represented in the McMansions set in the hills all around this green-Pelican Hills is the high rent district. As the course turns south with the Pacific just over your shoulder on the right my favorite hole is the rough and tumbling Par 4 ninth. This is full Pine Valley look with a drive off a high perched tee down a log flume which, if you can hold the center line of the fairway, will allow your Titleist to roll forever. The second will be a club and a half more played off a down slope into a shelved green set half way up a monster hill laden with trees, folds, and an occasional mean bunker. There is absolutely no margin for error in your distance control or towardness on this approach-anything less than 95% of intention is looking at trouble. The back nine plays about 250 yards shorter than the front mostly because of a couple of quality short par fours and only one five par. 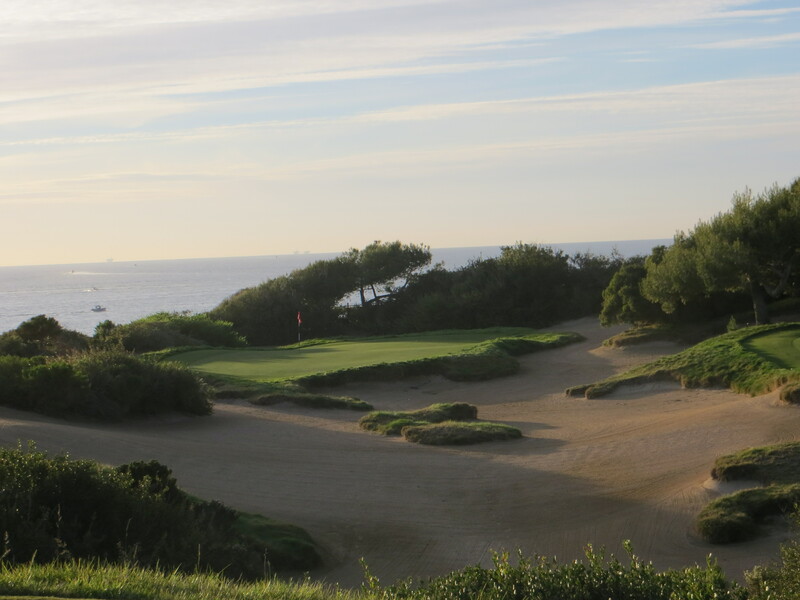 The first of the short fours is the eleventh, a swooping dogleg right thrill ride heading to the ocean. The very shallow green here is set on a shoulder above a deep bunker on the right so a well position tee ball on the left will set up nicely for a left-to-right approach into the center of the green. The slopes off of this green into surrounding hollows create bedeviling recovery pitches if your approach shot lacks articulation. Two holes later is the second portion of the short par four feast. This time the dell green complex is wrapped around a deep bunker front left with a stepped surface working from front right to back left. The opposite shape coming in will work it’s way up to this pin. Turning back to the ocean the 14th hole would feel at home on any Irish links course. The hole is delineated by trees set high on the hill tops but there is a vastness to the playing area all the way to the green. 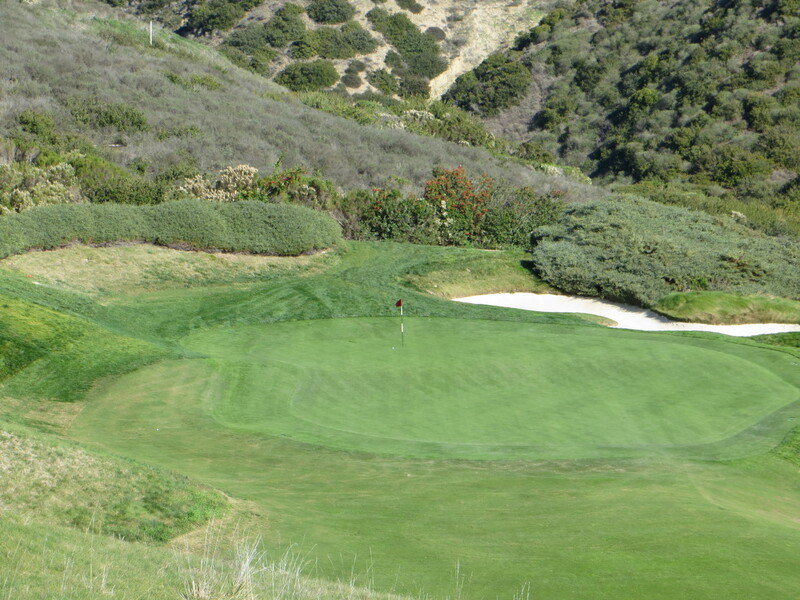 The approach is played up to a shallow false front green draped on the crest of the hill above a hideous bunker. Fazio provides a closely mown chipping area long and right where many smart approach shots will end up. While standing on the green take a peek over your shoulder, the view of the Pacific is breathtaking. After meandering inland for a couple of holes, the postcard hole of the day is the only par five on the inward half at seventeen. A pond in the elbow of the dogleg right wards you left off the tee and the hole then ambles uphill to a green perched on a ledge above the ocean. Positioning the second to the left gives the best angle for a short iron into a very narrow green with nastiness all around. 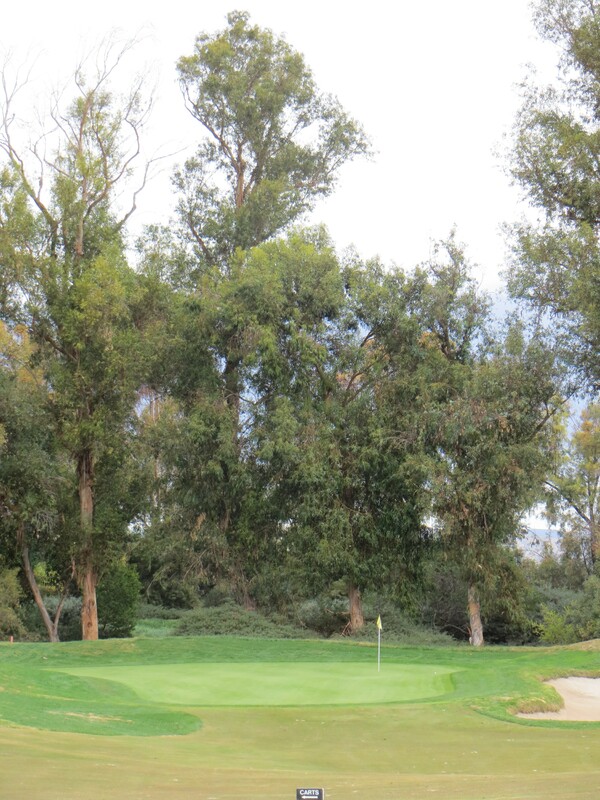 There is a single spread tree standing high above the green which gives this hole a very coastal California flavor. Your day ends with a kitchy, truncated par four that will stick in your memory all the way through dinner. After a bold drive up the left to the high ground you are left with a three story down approach iron to a green that looks like the under belly of a large Labrador sleeping on it’s back. Hitting the pink part is just plain hard. The Ocean North is of a decidedly different character to the South, less obvious drama but all the tactical punch. On a daily basis this is probably the course of choice to good players because wise tactics are rewarded and good scores should follow. Every once in a while you trip over a unique golf course, one that does not fit into any of the neat categories of course design. 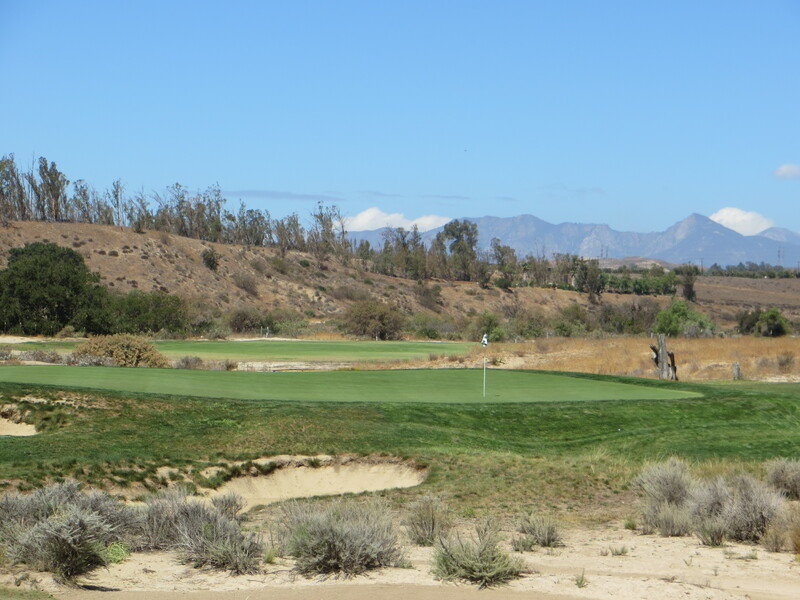 Rustic Canyon is one of those, a blend of links design with an arid desert course feel. 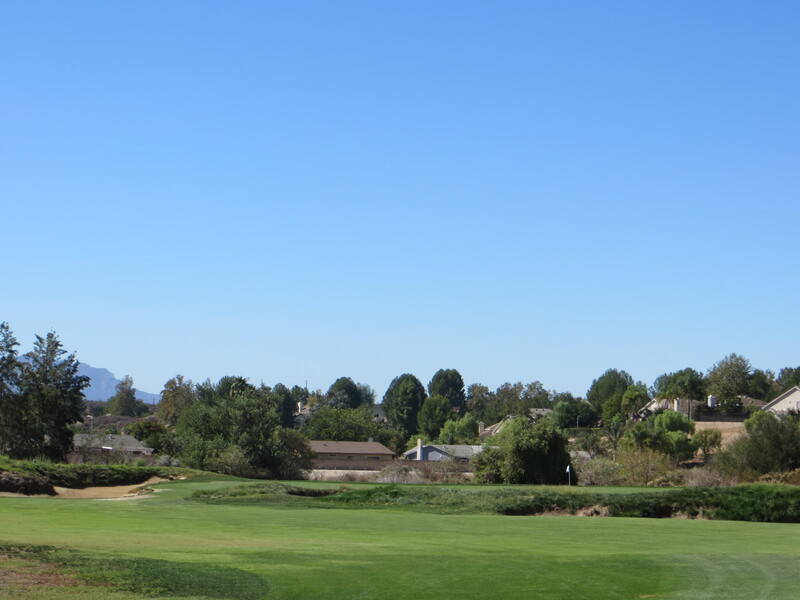 Created by Gil Hanse with the help of long time associate Jim Wagner and golf writer Geoff Shackelford the course was built on flat firm, sandy turf in a two-mile long arroyo between dusty foothills about 40 miles north of the Los Angeles sprawl. At first glance the land must have seemed ill suited for golf, but credit the imagination of these three guys to come up with a rough-edged “rustic design” to delight and challenge golfers of all abilities. 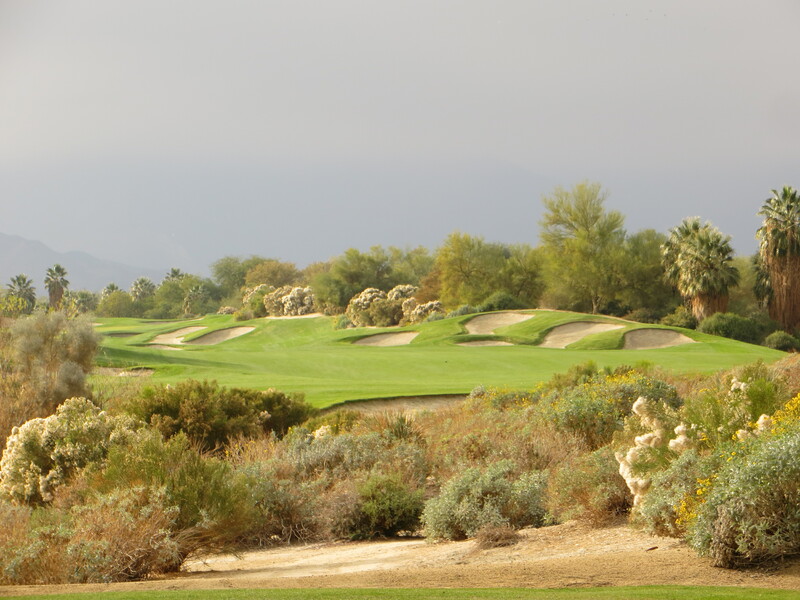 A dry wash full of distinctive desert vegetation and scrub dominates the center of the property and provides most of the hazards the golfers will encounter. 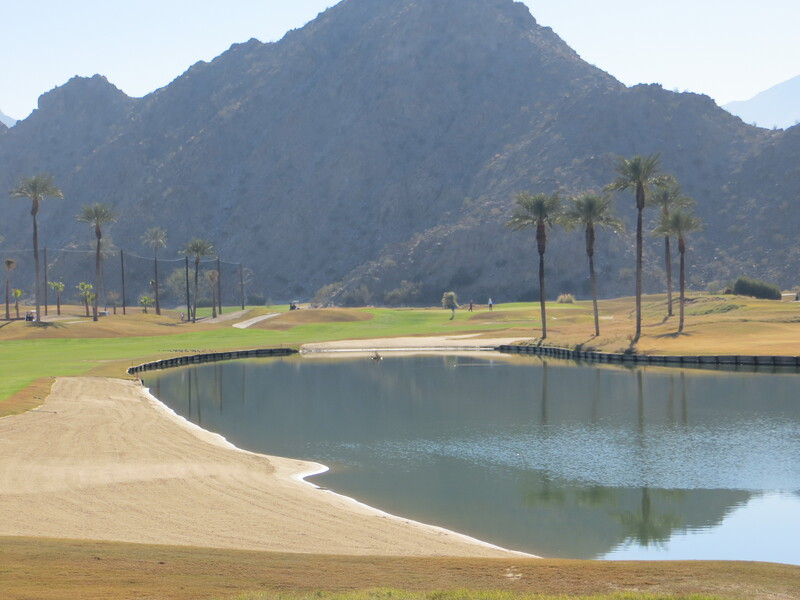 With wide open fairways, an absence of trees, no rough to speak of, natural desert hazards complimented with a limited number of Wagnerian thick-lipped jagged edged bunkers, and no man-made water in play, they used a minimalist approach to integrate natural beauty and topographical nuance into an almost intoxicating golf experience. Taking a page from the links formula of course design they created holes using broad fairways and angled proximity to the natural hazards coupled with wide, flowing, and uncluttered green complexes. There is a vague similarity to what Hanse did seven years later at Castle Stuart Golf Links where he built a user-friendly links course with wide driving areas and strategic approach lines on stretches of rolling terraced land overlooking the Moray Firth in Inverness, Scotland. As you often see in the British Isles these green complexes, many of which the surrounds blend seamlessly into the green surfaces, encourage ground approaches. Depending on wind direction and pin positions each day this makes for an inherent variety of strategic approaches. Managing one’s way successfully around this place takes a links mentality where every shot requires proper consideration of how it affects the next shot. This means at times one must temper aggressive instincts and allow the flow of the course to dictate the proper and efficient way to play. 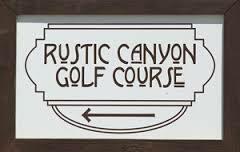 The first order of business was that Rustic Canyon be assembled as a municipal facility to serve golfers of every ilk in Ventura County and the greens fee had to be quite reasonable. The driving range, short game area, and practice putting green are modest but adequate to provide players a proper stage prepare for the day. Golf carts are outfitted with a rudimentary GPS system that can be very helpful considering that the lack of trees makes depth perception an enigma and visual distancing a challenge. 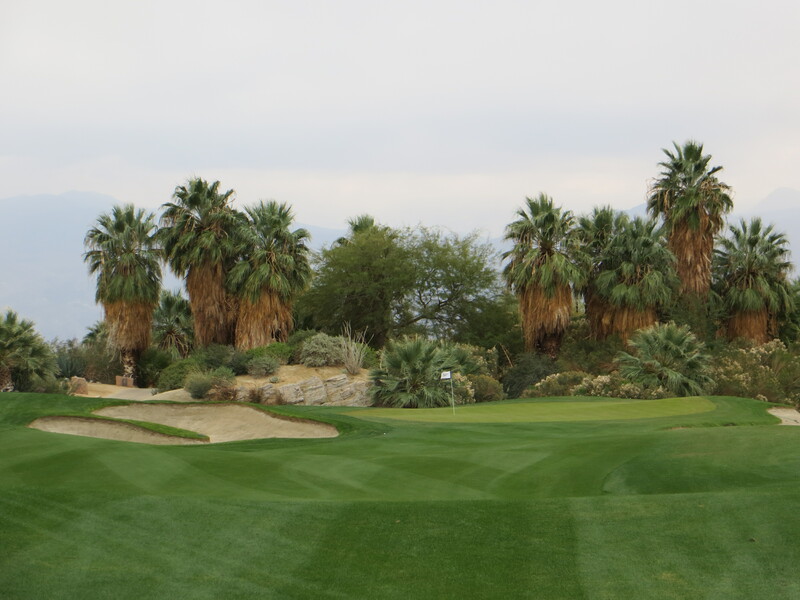 The course is walker friendly with hand carts available and there is a pricey hand drawn minimalist yardage book that can be helpful as well. The yardage book is done in the style of the touring professional so it has all the real detail a thinking player needs without the glossy window dressing. But honestly you have to be of a particular mindset to find this yardage book user friendly. With four sets of tees on the scorecard there is a distance to present the appropriate challenge for every handicap. You will note that there is a peculiar fifth choice, the Hanse tees, that is actually a Pu Pu Platter of holes from the Black, Blue, and White Tees. It makes for a wonderful 6400 yard challenge if one thinks the Blue Tees at 6634 is more than they can chew. Playing the Hanse tee you have to pay attention to the Hanse scorecard yardage for each hole to see which color tee to play on that hole. 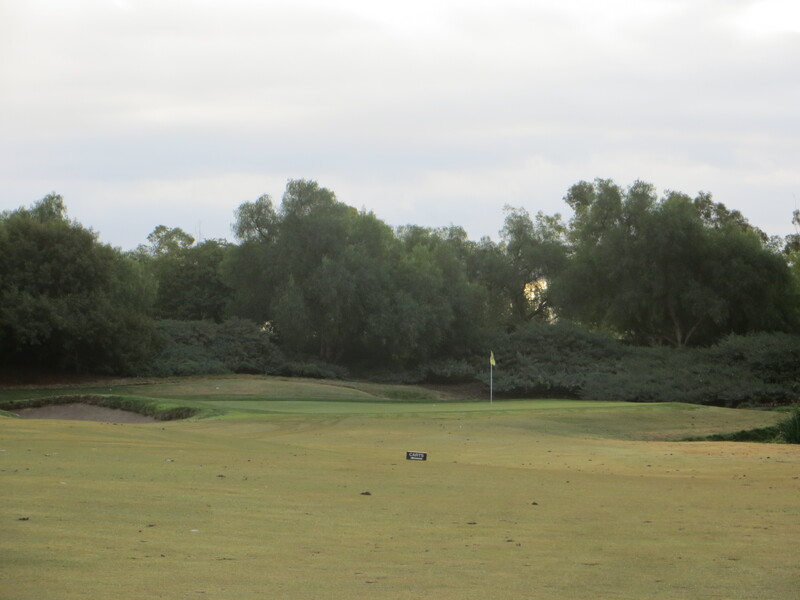 The shorter holes are often played from the Black Tees which satisfies the perverse macho element in most of us-that in itself makes for an interesting twist. The opening hole is a perfect example of the design characteristics you will see all day. Standing on the tee of this five par the harrowing bunker on the right makes the driving area appear seriously constrained whereas it actually widens past the bunker to almost 70 yards of width and a warm welcome for almost any drive. 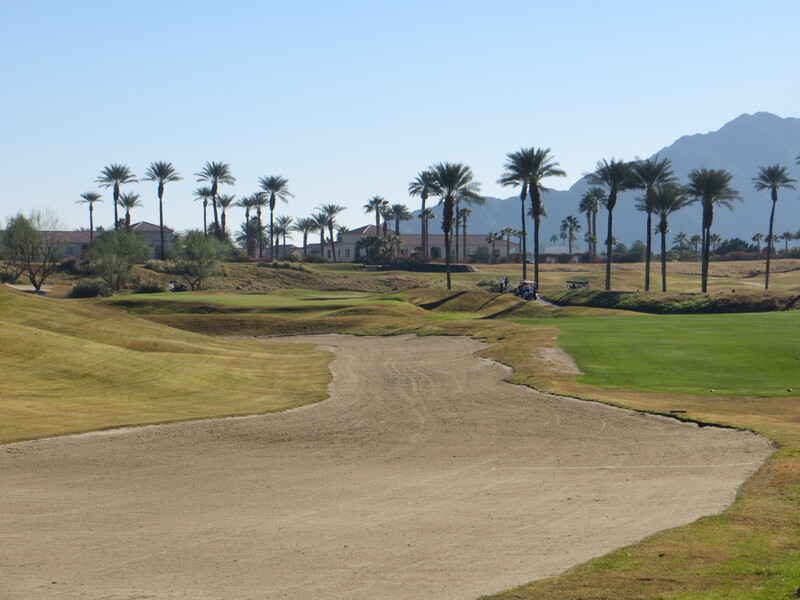 In spite of this wide driving berth, position is very important depending on how you will negotiate the dry bed fissure on your second shot that bisects the last 140 yards of the fairway into the green. For a bump and run approach shot into the green, the second shot needs to be played from the left side of the driving area deftly into the narrow channel of mown fairway grass left of the fissure. Up the right off the tee allows for a longer second shot lay up to a more open area closer to the green but what is left will be a lawn dart pitching club across the hazard to a green steeply pitched toward you. If the pin is on the front right this can be a difficult approach and putt to negotiate. Throughout the day these types of decisions have to be anticipated so it is a matter of knowing where the pin is located and plotting an approach path that is appropriate. Further study of the scorecard reveal quirky hole yardages and hole sequencing that is equally intriguing. The front nine has three par 3s and three par 5s with all the par threes coming in a five hole sequence. In the links tradition the three pars have great variety from longer semi-blind approaches to large sprawling greens to short pitches to small greens surrounded by deep sand pots or nasty grass hollows. Throw in a two very imaginative short par fours on the outward nine and you are playing an a collection of finesse holes where length is of little advantage. The 8th is a classic Irish Par 3-the challenge seems simple but add a wee bit of wind and……. As you make the turn sequential technical par 5s on nine and ten followed by another on thirteen provide good scoring chances in the second leg of your Nassau bet. The heart and soul of the back side are three long and challenging par 4s which set an entirely different cadence for the way in. To further complicate matters the routing keeps you off balance as the hole directions switchback five times on the back nine. With any prevailing North/South wind down the valley this will wreak havoc on your swing rhythm and force you to play differing trajectory controlled shots on every hole. 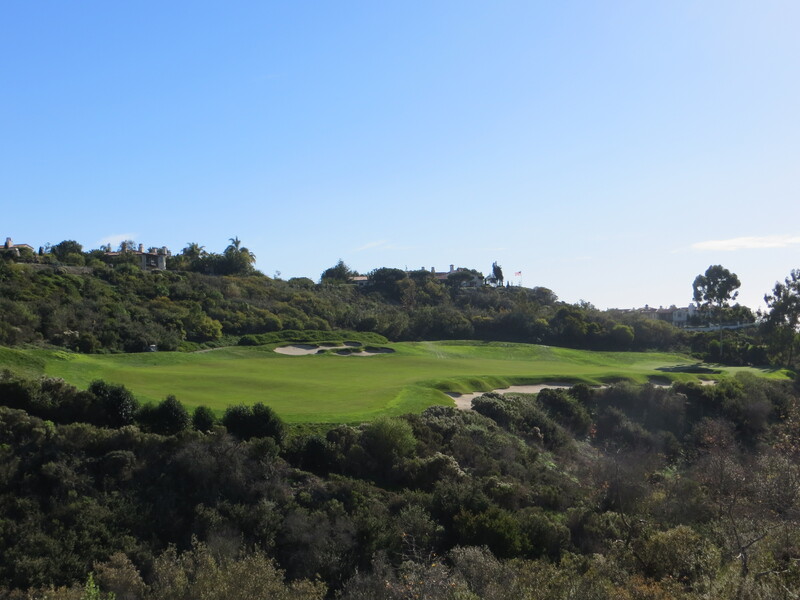 It is hard to imagine as you walk the course that there is actually a 240 foot drop in the property as it works from the top of the valley to the bottom. The last change in direction on the sixteenth tee will release you on a downhill ramp that stretches the rest of the way to the clubhouse. This makes for three of the most majestic holes you play all day but the increment of club selection adjustment can be astounding, especially if the wind is at your back. Ground control to major Tom…..it is the only way to control the approaches into the last three greens. The Hanse crew was determined to create a rustic golf experience with the natural design feel of the architects of the Golden Age of Design who could not move large quantities of dirt to make a superb golf holes. Honoring that tradition, Rustic Canyon requires thoughtful play with strategic agility. The satisfying feeling of mental exhaustion one gest from negotiating the vagaries of a classic design is something to reflect on long after the Rustic Canyon experience is done. 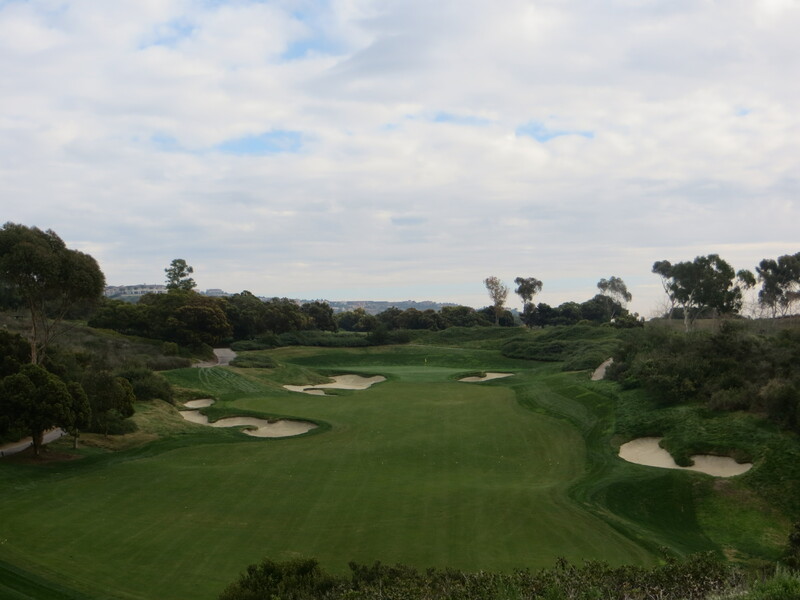 The Ocean South is the first of two stunning seaside offerings Tom Fazio did at the Pelican Hills resort overlooking the Pacific at Newport Beach. Pelican Hills is a grand resort done in the 16th Century Palladiam architectural style of Northern Italy. Everything about it is large scale, top shelf, with great attention to detail. The golf facilities share all three of those characteristics. From the moment you drive up it is obvious that everything about this place-the front entrance, clubhouse, golf shop, and restaurant speaks of a high end private club. They spared no expense in developing the property. Hell, the on-course bathroom facilities are probably in the $1.2 million dollar range. This would be a lovely course to walk and appreciate the dramatic ocean views but the golf course is built on a severity of the terrain with long walks from greens to tees that takes away any consideration of walking. The carts are even outfitted with performance seats with side cushions to make sure you stay in place on some of the billy goat turns. The only disappointing feature is that the practice facilities-range, short game area, and practice putting greens-are really not up to the standard of the rest of the place. Try not to be distracted by the jaw dropping beauty of the opening hole. First impressions matter. Once you drive down the path from the staging area you cross the most expensive cart bridge on the planet and pull up next to the first tee box to watch the world unfold beneath your feet. The grandeur of this impression should not be lost on you because it will be repeated throughout your four and half hour tour of this course. From the high perch you have a sense of vertigo as you try to maintain your balance looking down a tree lined 400 yard log flume that spills to a green resting on a grass ledge above the ocean below. The question crosses your mind as you prepare to alight your drive, is this ball ever going to stop rolling and will I be able to play from where it comes to rest. Keeping your ball in front of you through the day is a must because the wayward shots have a way of becoming unplayable. Par 3 4th-the first look down into the gorge at a majestic green setting. After the free fall on the first Tom marches you right back up the hill from which you came and you will get to the environmental gorge clusters that dominate the center of the property. After a dramatic two story downhill approach to the par 3 fourth green, you are staring to your right across an environmental abyss that would feel right at home at Kapalua on Maui. Your play on the fifth is across and adjacent too this intimidating haven for rocks, scrub, and critters that will make your knees chatter. Having the focus to pick targets and make unfettered swings is a requisite in this version of target golf. When your ball does start to wander just let the fear of the result go and bask in the wonderful beauty of the terrain that just ate your Titleist. The full length of this hole on the 5th hangs precariously above the snake sanctuary. Skirting the gorges for a few holes you step out of your cart onto the secluded seventh tee. This hole is ensconced by trees, water, sand, and some serious boulders creating a surreal sense of tranquility as you ponder the articulate task at hand. The ensuing short ride to the eighth tee will take you by some troll caves on the left amongst the boulders and a look across Walden Pond to the landing area in the eighth fairway. It is almost like you should have brought your sketch pad or a writing tablet instead of 14 clubs, there is something genuinely mesmerizing about the atmosphere created in this corner of the course. Fazio used the artists full palette of features on the par 3 7th. Working your way out of the deep topographical divides over the next three holes allows you to catch your breath and prepare yourself for the pure sensory drama of the seaside holes ahead after the turn. Make sure to charge your camera battery before the round because you could fill an entire flash card with stunning images over these three holes. Sand is the major concern on the 11th-first of the seaside holes. Baywatch begins on number 11 with a downhill march to the beach. Unlike on number one this time it is literally to the beach as the sand and rock outcroppings that frame this green complex will bring to mind Lawrence of Arabia. The approach shot into this green is one of the scariest shots you hit all day-anything missed to the right will be painful series of recovery attempts from Ramal’s abyss. Elevation change is the least of your worries on the Par 3 12th. The next two holes are a unique tandem of consecutive seaside par threes. This is not like at Cypress Point or Bandon Dunes, not near as punitive, but the holes pack visual drama that will be the postcard images you remember in bed tonight. The first is a carry over a large piece of the Sahara to a long and narrow green hanging precariously above some nasty sand pits. The ocean backdrop makes it difficult to frame the target so you have to trust your yardage and give the wind a bit of respect in picking your club. Serious tilt from back to front in this one so being on the green is no guarantee of making a par. The small back left green on #13 is an elusive target into a prevailing wind. As I mention in the detailed descriptive of the course below Tom was of two minds when he looked at the ground for this next hole so rather than decide which he liked better he created a short pitch three par with two green settings. The one on the left is the more dramatic and wind affected-the tiny green surface makes that task all the more forbearing. 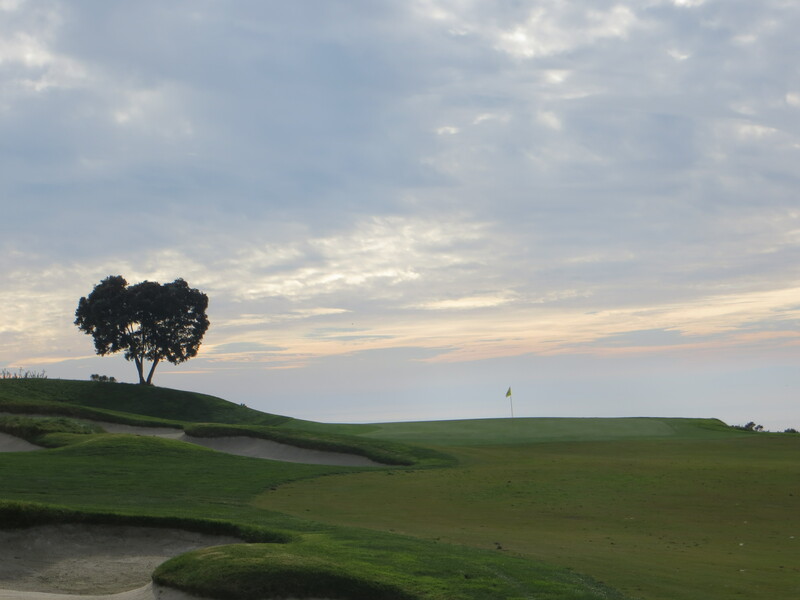 Take a moment to walk off the back of the left green to catch a glimpse of the jagged California coast line that is a Kodak moment for sure. 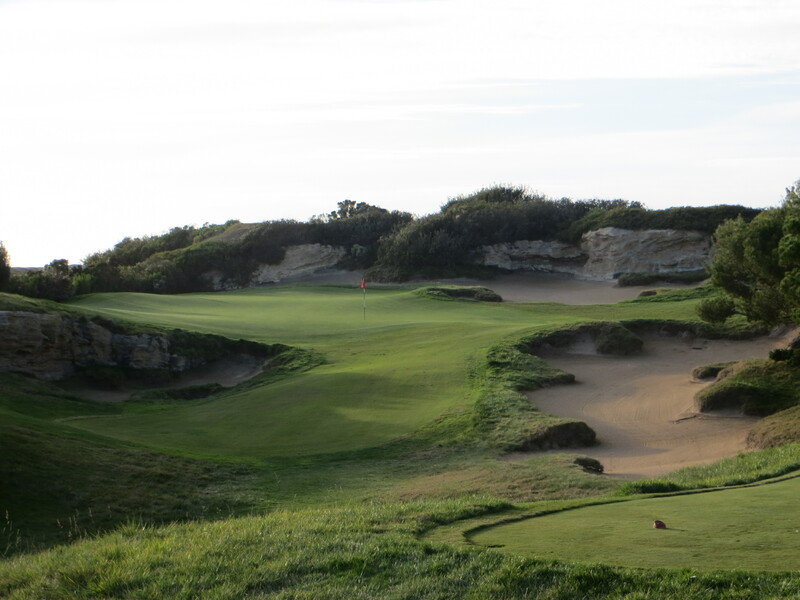 After the breathtaking seaside romp, the transition par five that comes next will give you a chance to regain your balance before your return to the gorges and a very demanding set of finishing holes. Fifteen is quite unusual, a hole that would feel right at home in the rocky terrain of Eniscronne Golf Club in the north of Ireland. You drive wide left to a precipice landing area respectful of a furry wilderness that shadows the right side of the hole just beyond the corner of the dogleg. Your approach has no margin for error as the narrow sliver of a green hangs off a Jai Alai wall on the left and the wilderness preserve on the right. Two well placed shots and two putts would be extremely gratifying as you head to the sixteenth tee. 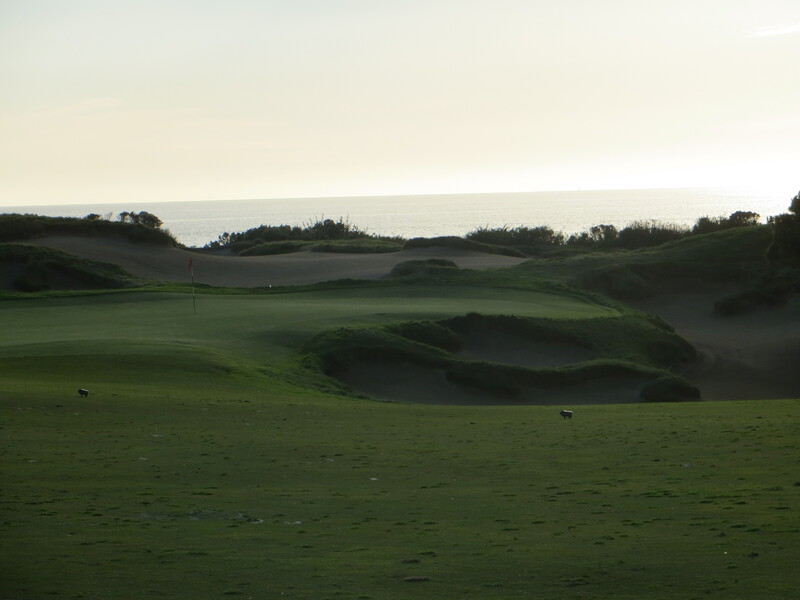 The last of the three pars is drop dead gorgeous especially if you playing it late in the day into the setting sun over the Pacific. It calls for a full hybrid or fairway metal across the gorge to a green set on the edge of the horizon. The mound above the green on the left has a tree that stands sentry overlooking the green. This vista has the Monterey look of Carmel Bay to it. After a very rigorous three-shot par five on seventeen the finishing hole is a potpourri of everything you have seen today. Needing a par here to win the back nine is a tall order. This is a double hop scotch affair where you drive away from the line to the green to a grassy plateau across the ever present gorges. 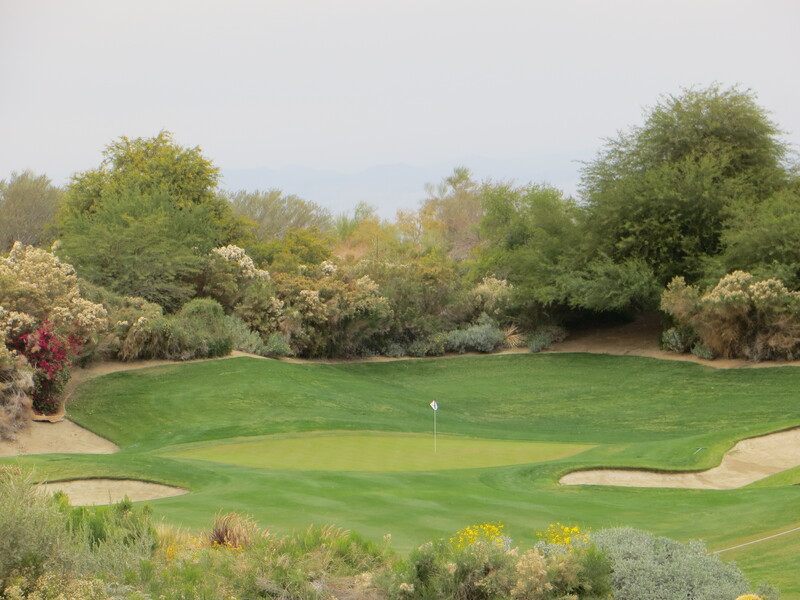 The second is either a lay up to a landing area left and short of the putting surface or a bold carry over more oblivion to a long green set on a diagonal into a ledge above the grassy canyon. Pitching up the length of the green from the lay up area is a doable up and down. If you figure out how to save your par here that après Guiness will go down smoothly when you are done. 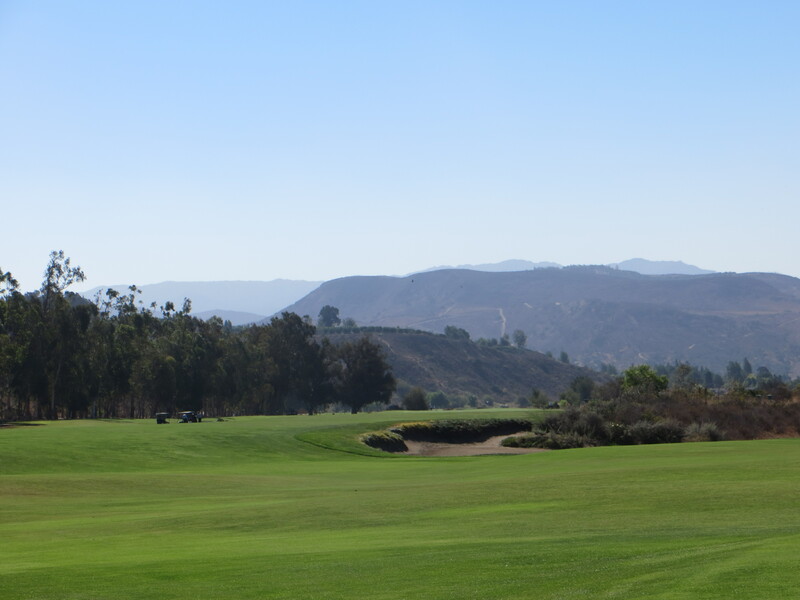 This course is a pure southern California experience-perfect weather, stunning vistas, and unique gorge laden terrain for making memorable golf holes. Much like Pebble Beach this a place where the golf seems almost secondary, four hours of riding up and down these hillsides will leave you with a strong sense of why so many people want to settle in this part of the country.